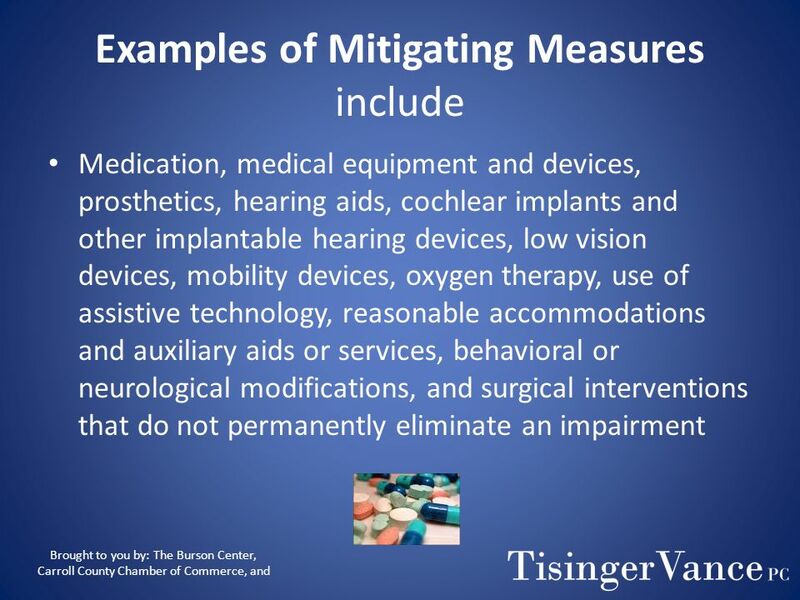 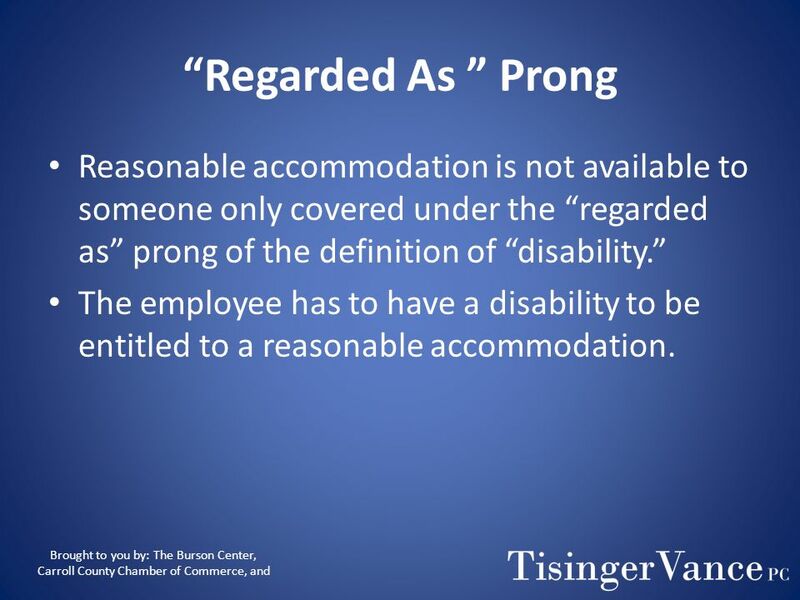 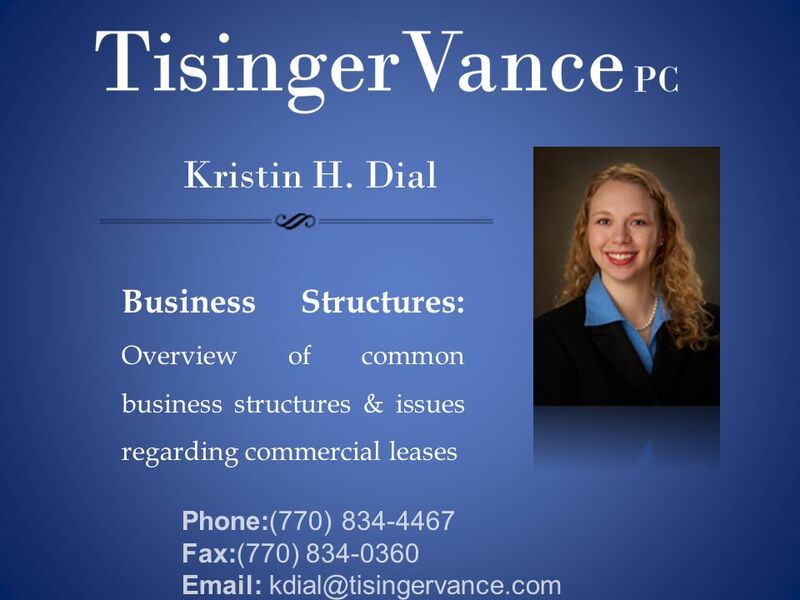 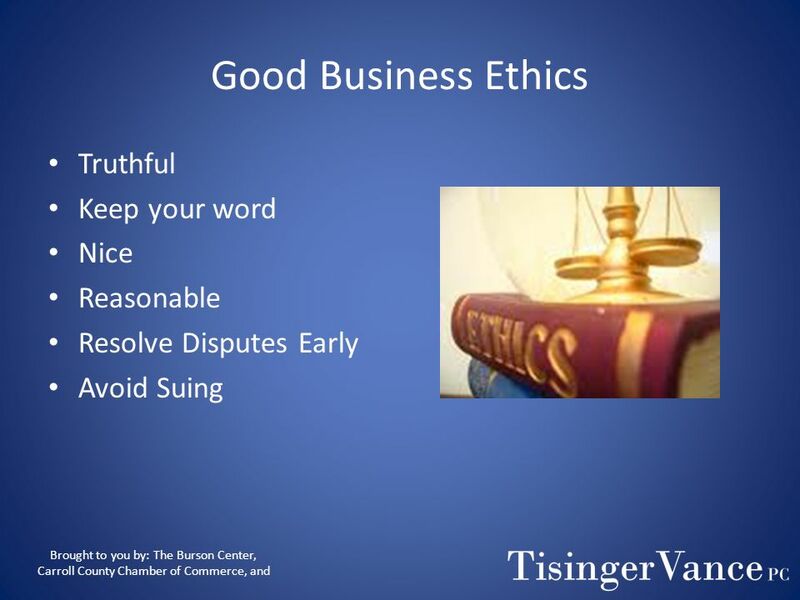 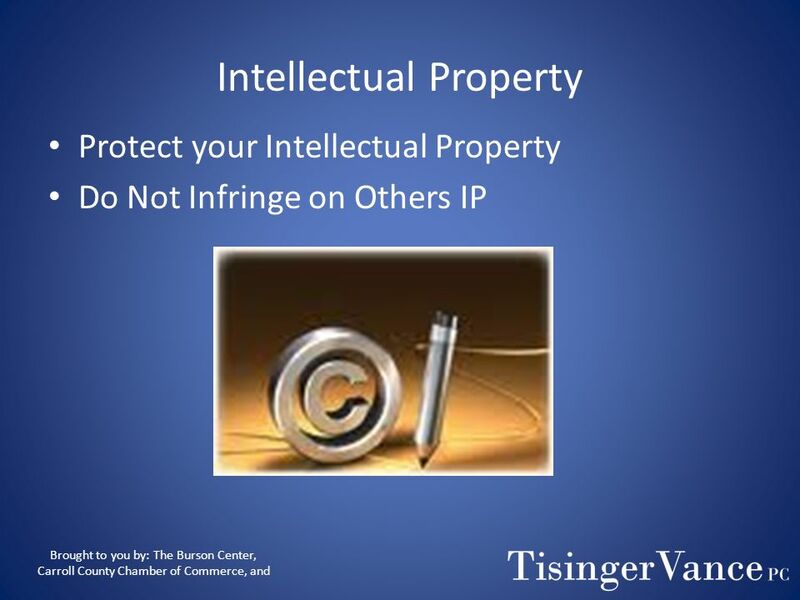 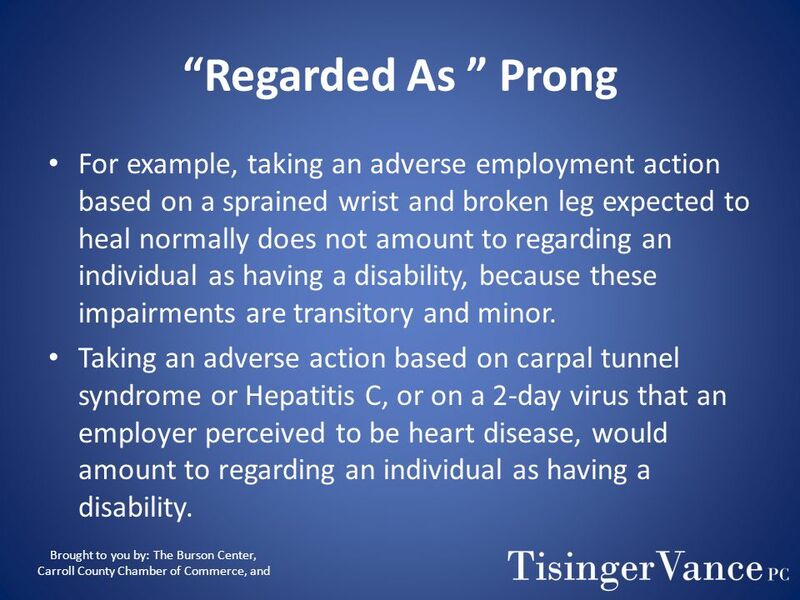 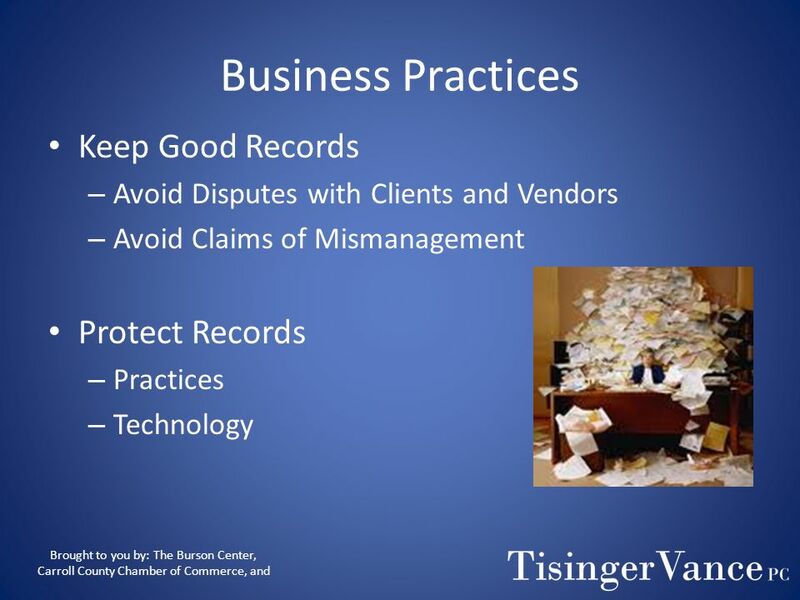 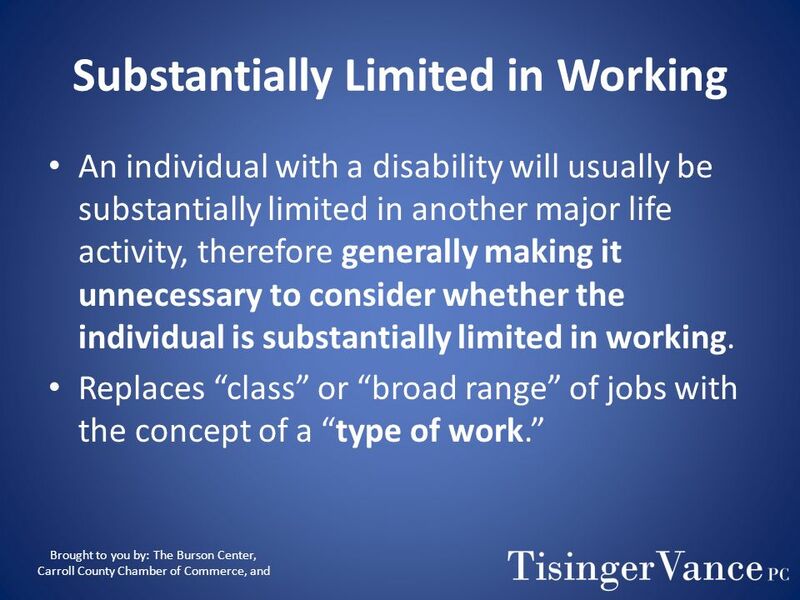 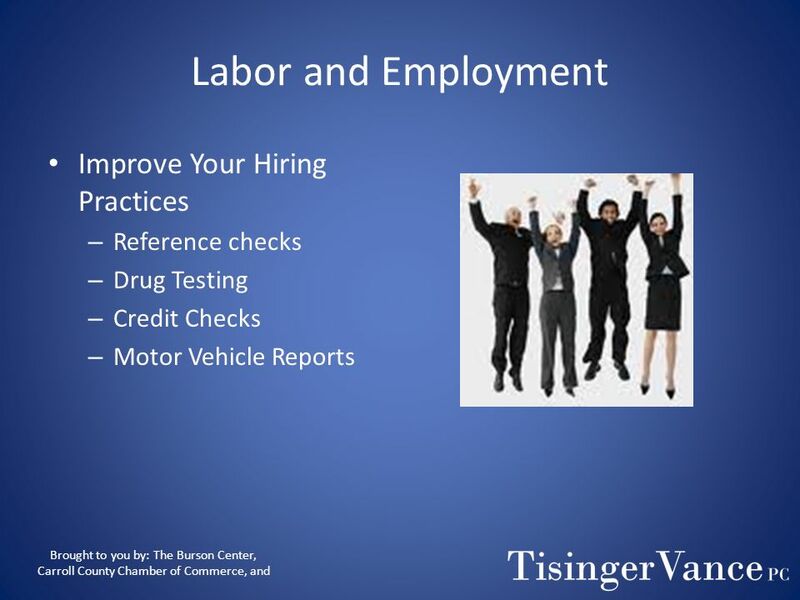 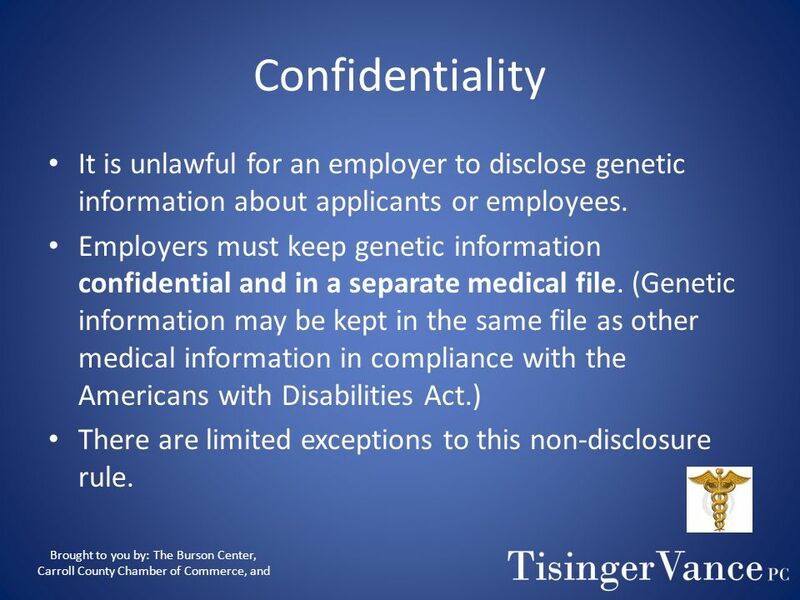 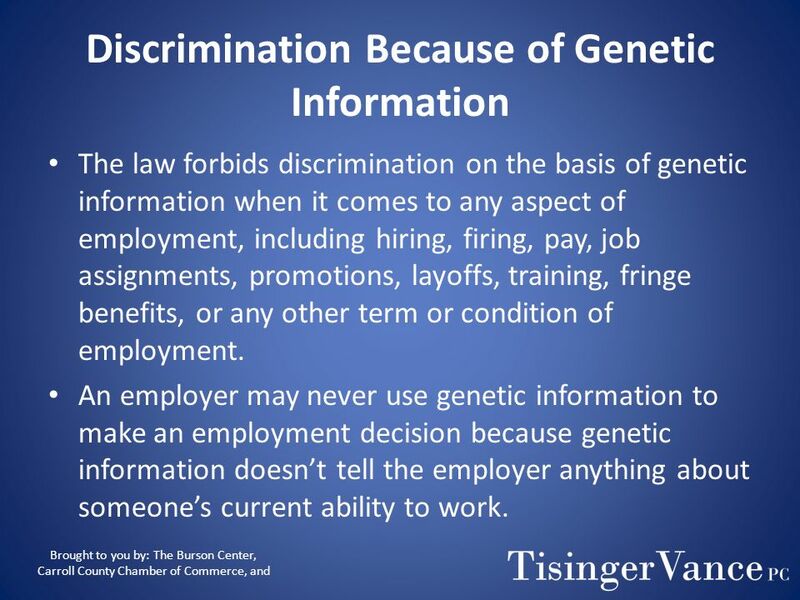 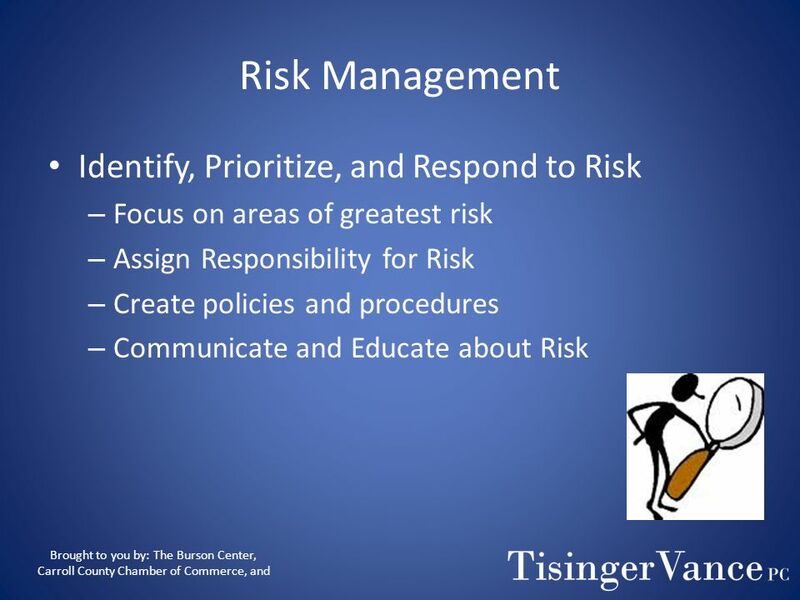 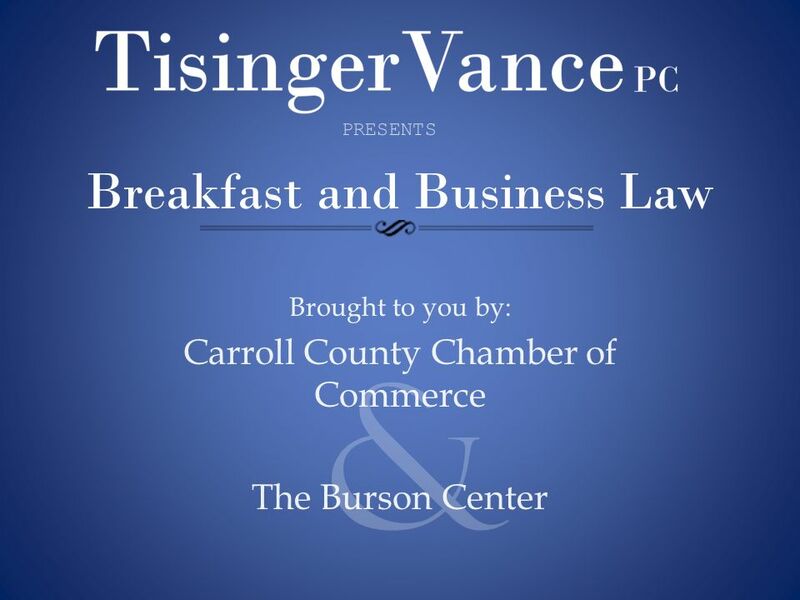 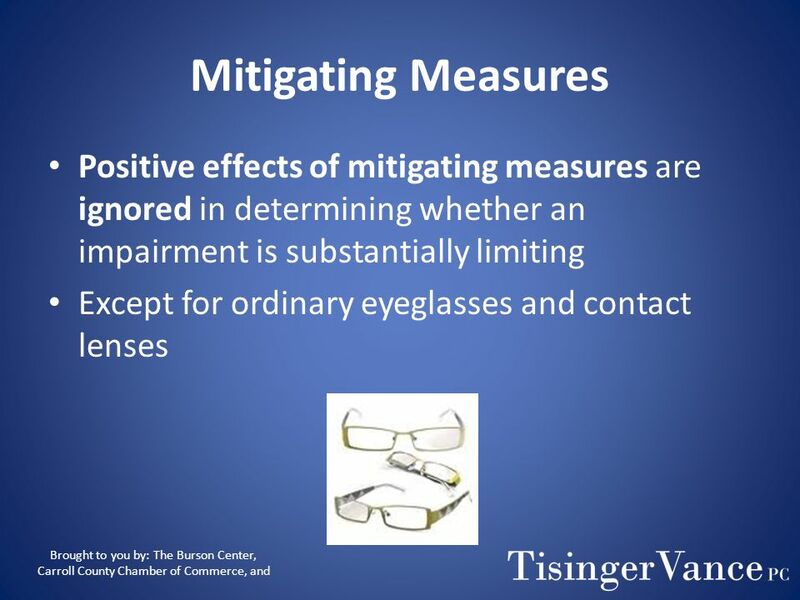 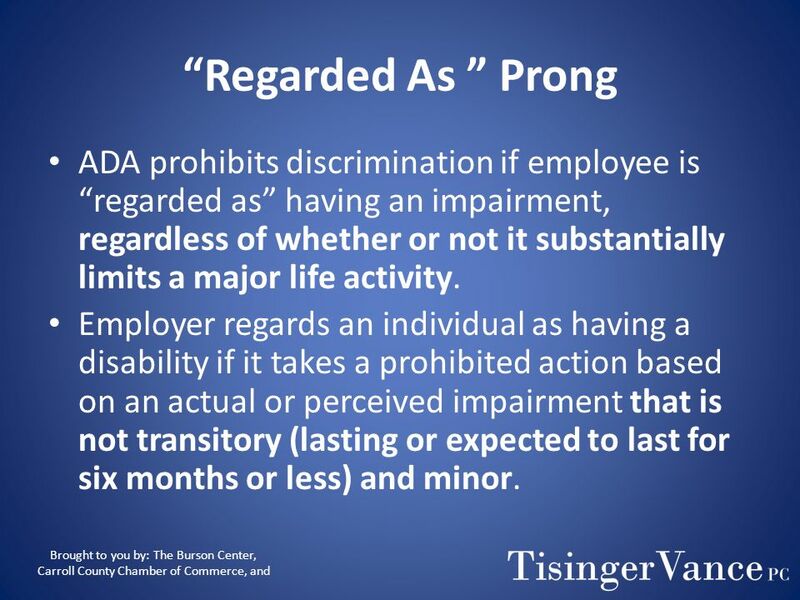 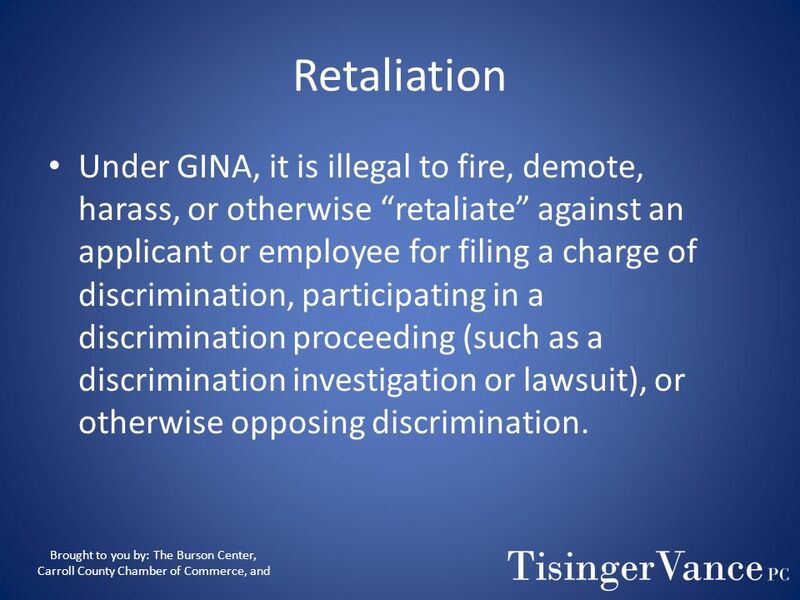 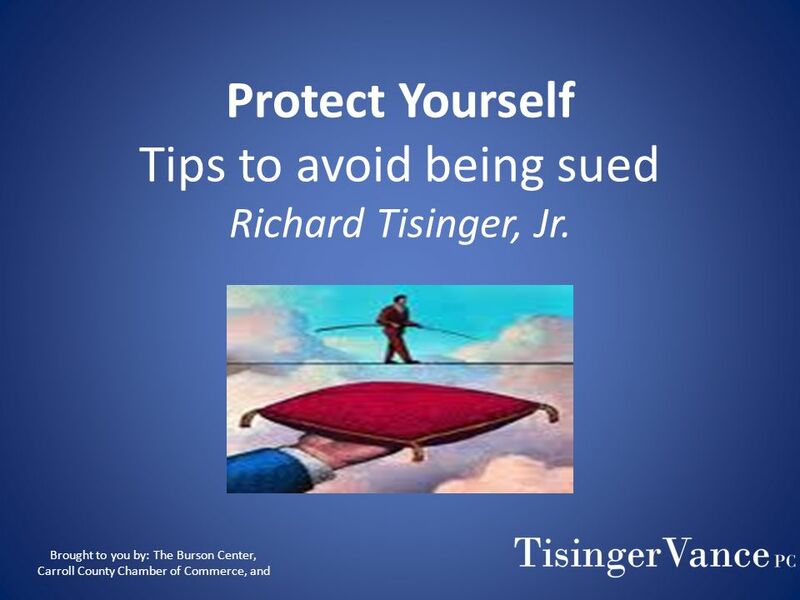 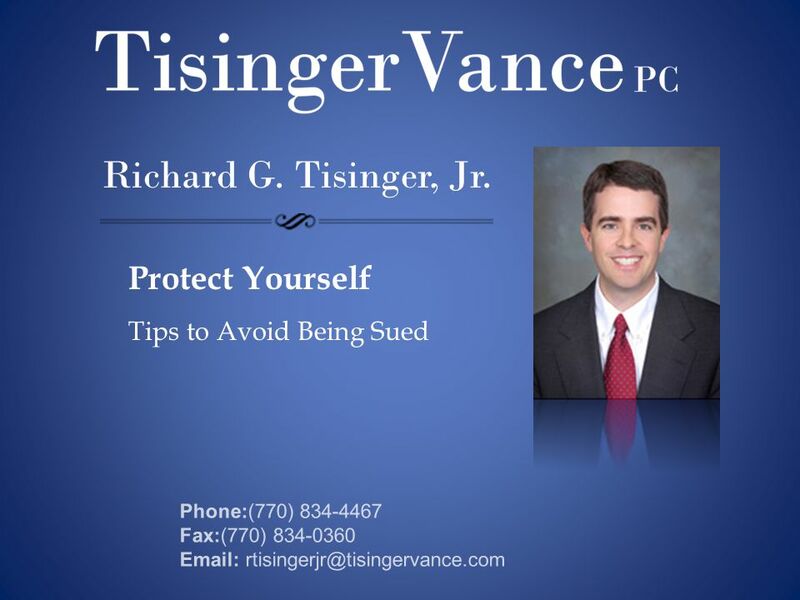 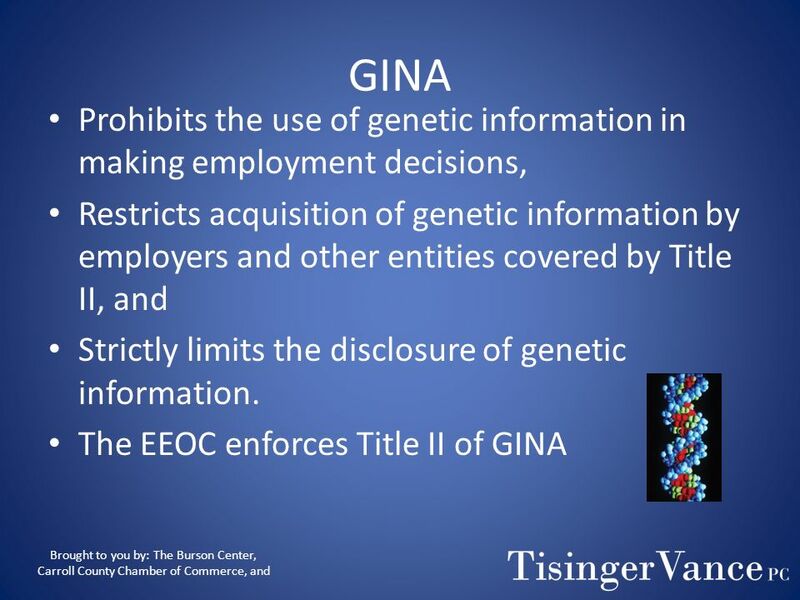 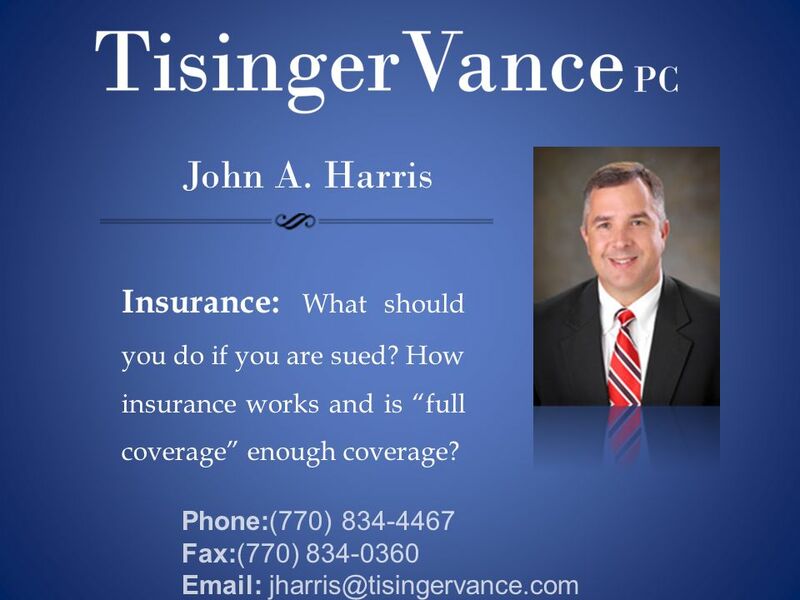 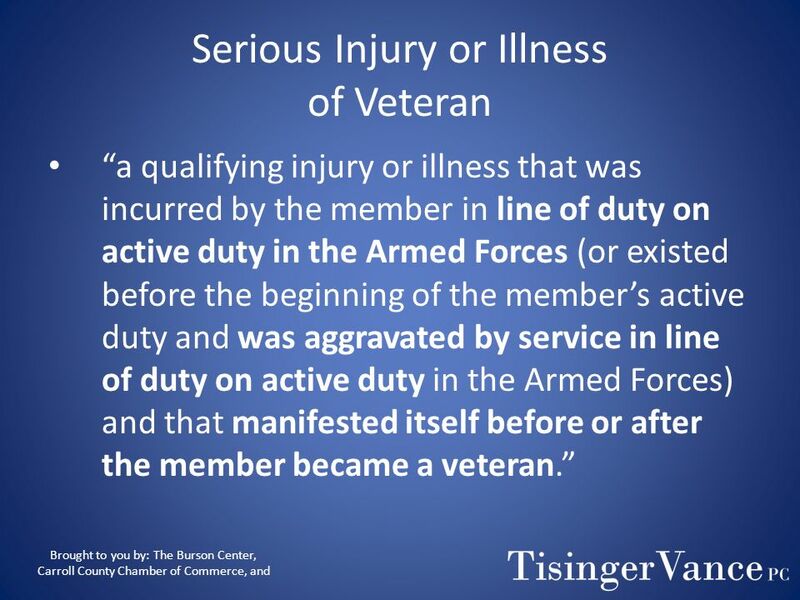 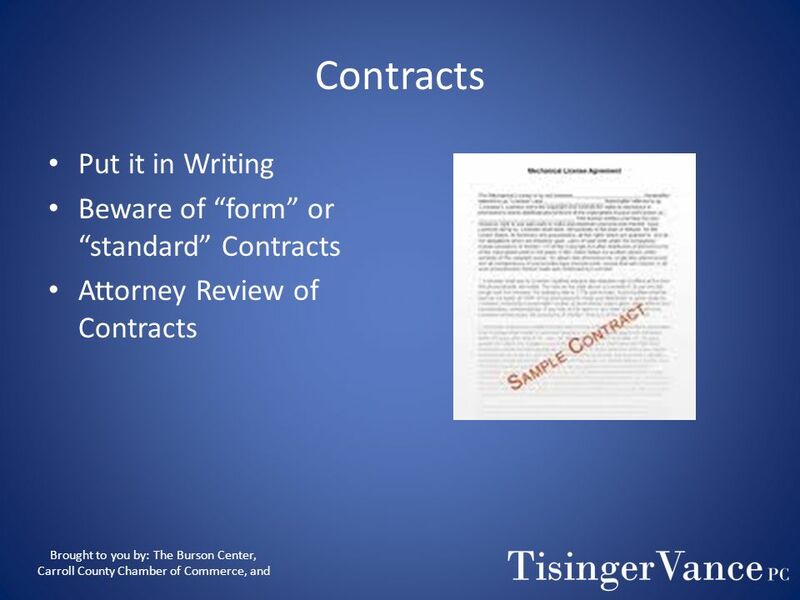 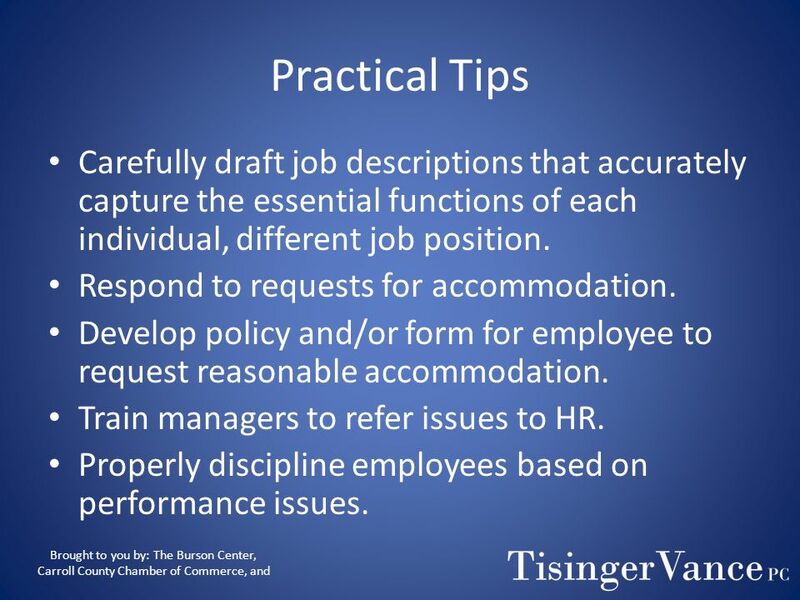 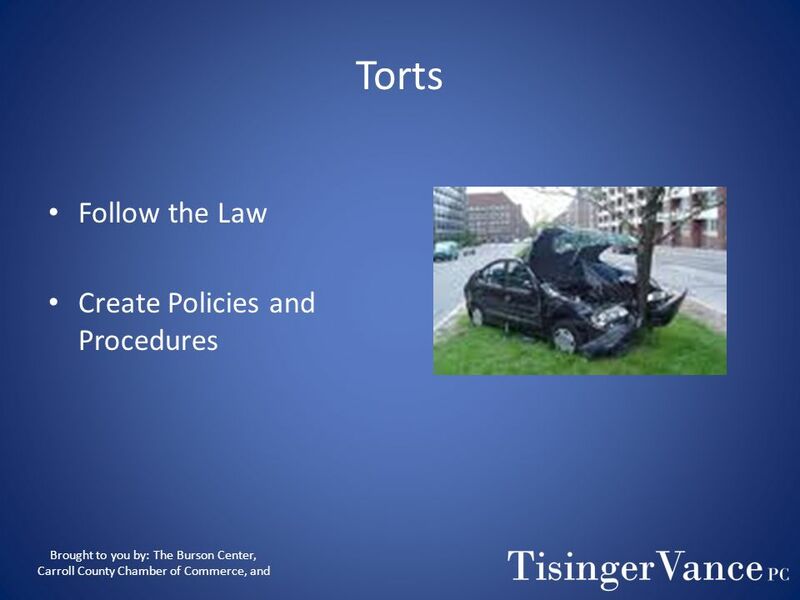 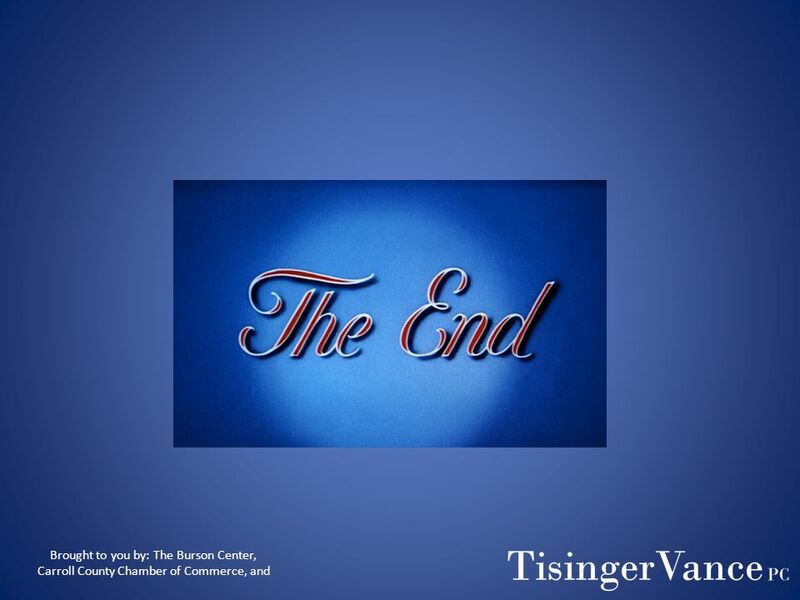 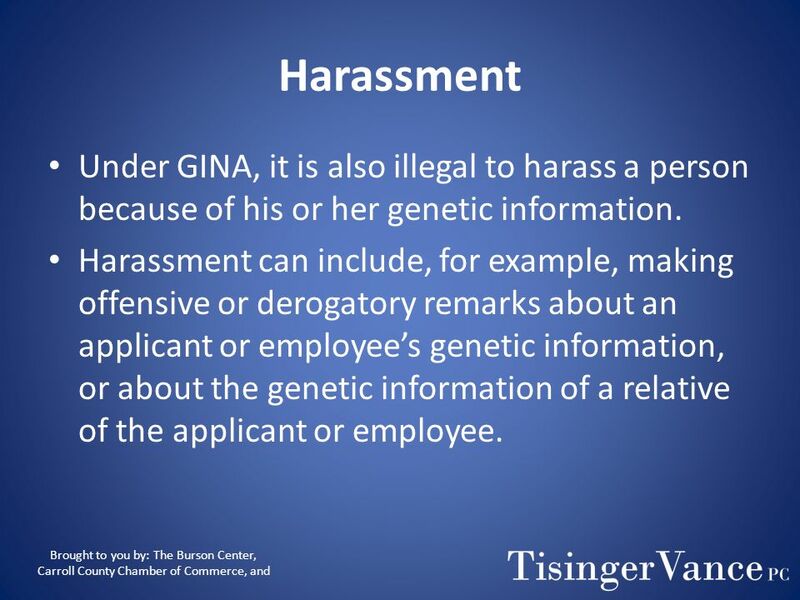 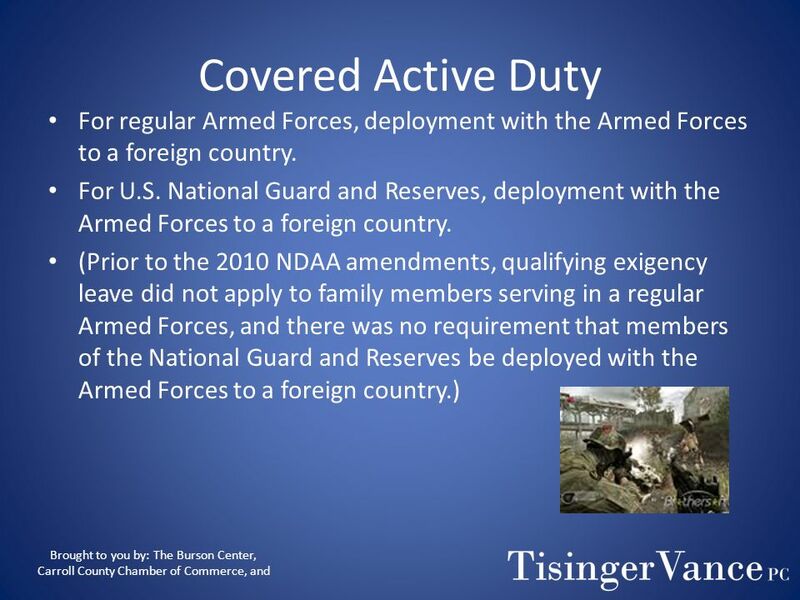 3 Protect Yourself Tips to avoid being sued Richard Tisinger, Jr.
44 Covered Employer All public employers regardless of size. 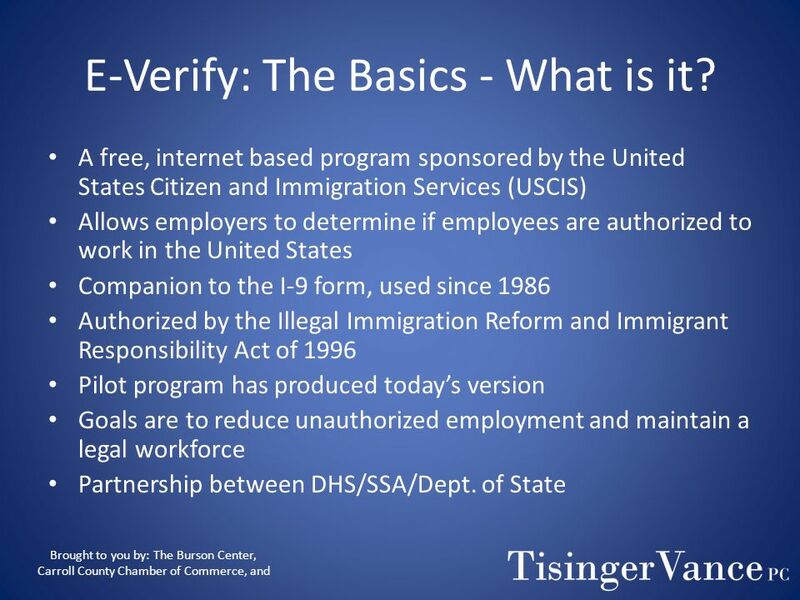 72 E-Verify The Basics What is it? 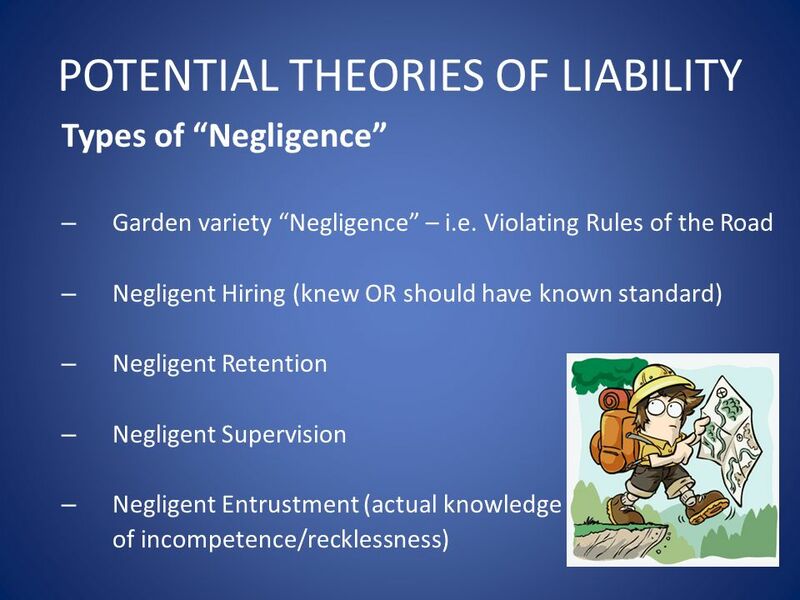 Who does it apply to? 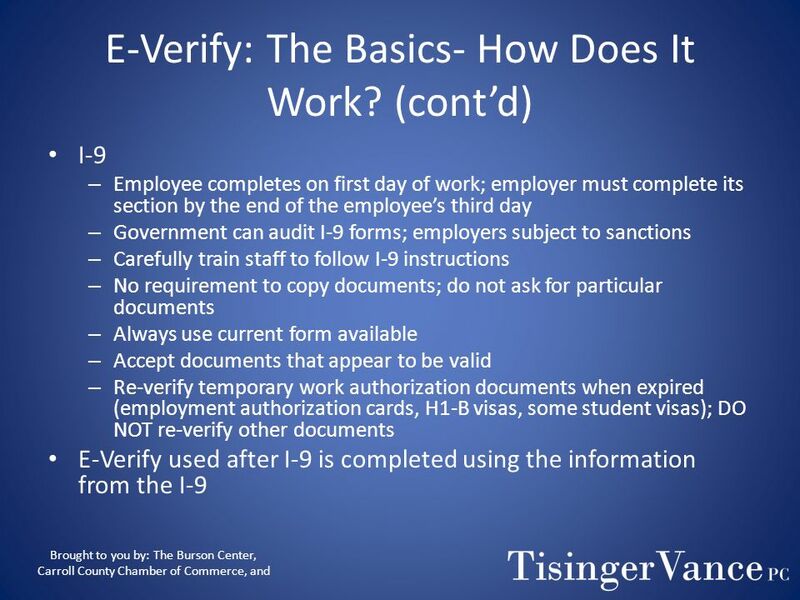 73 E-Verify: The Basics - What is it? 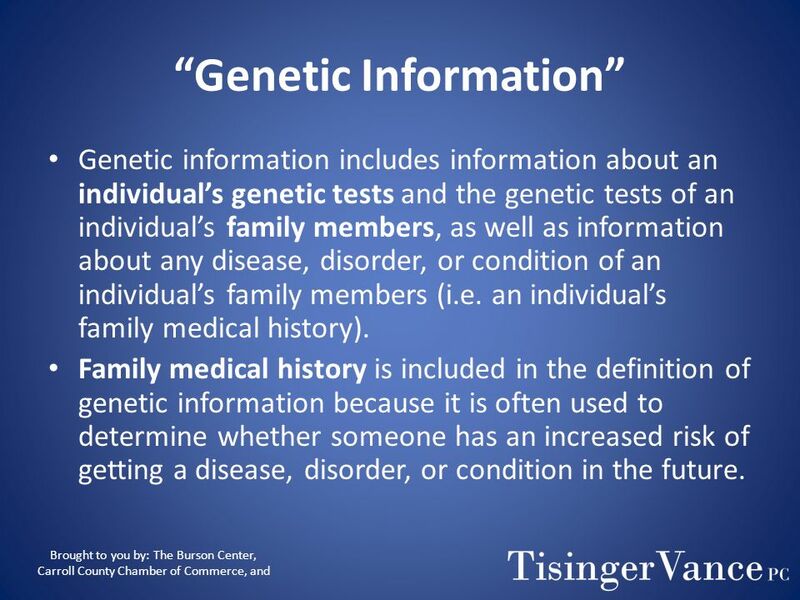 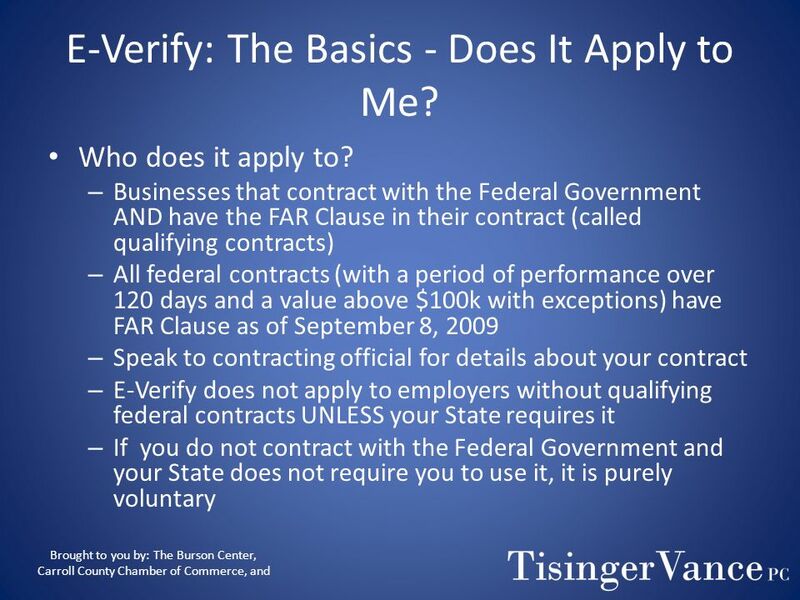 74 E-Verify: The Basics - Does It Apply to Me? 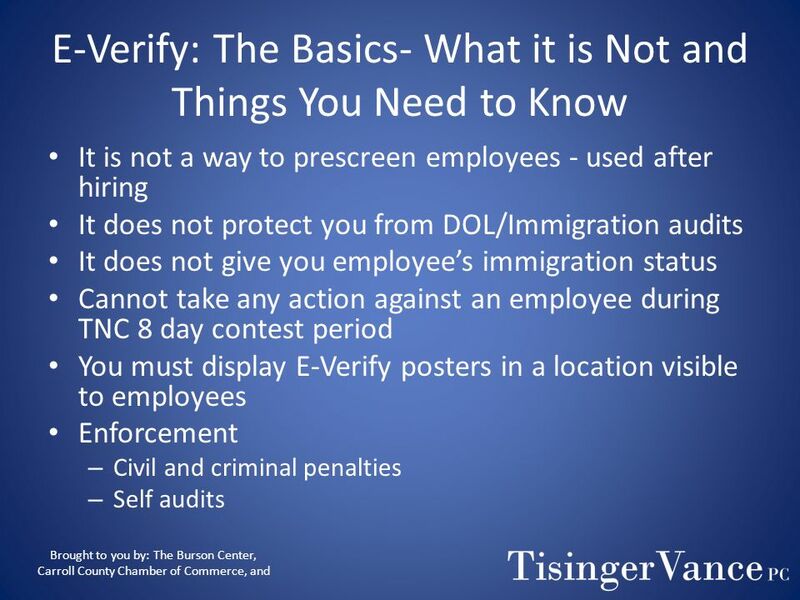 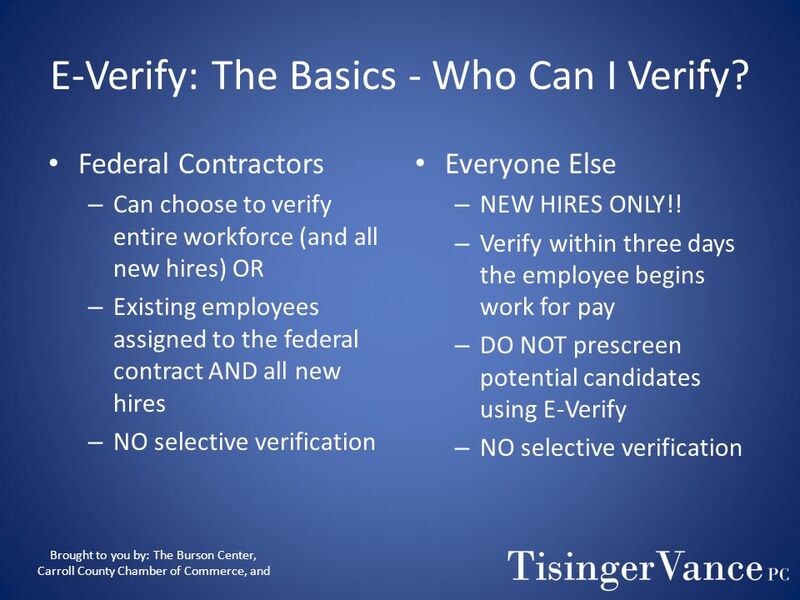 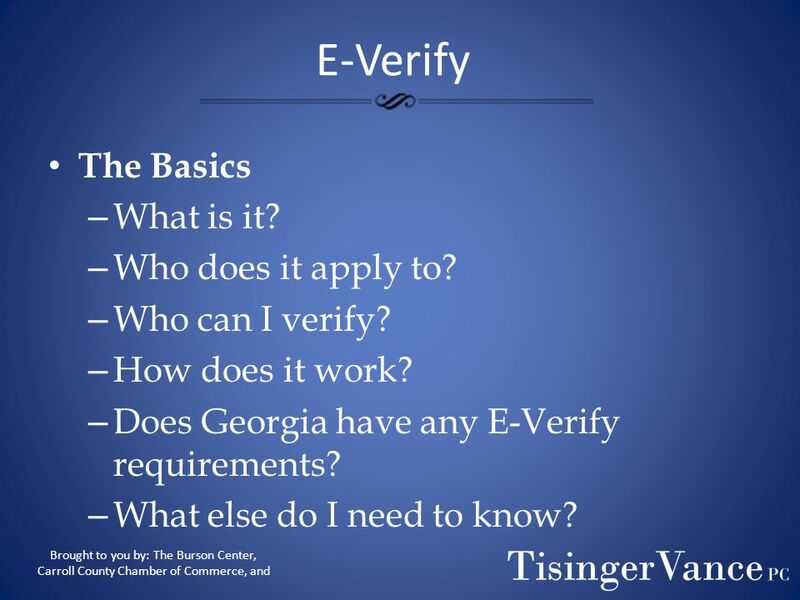 76 E-Verify: The Basics - Who Can I Verify? 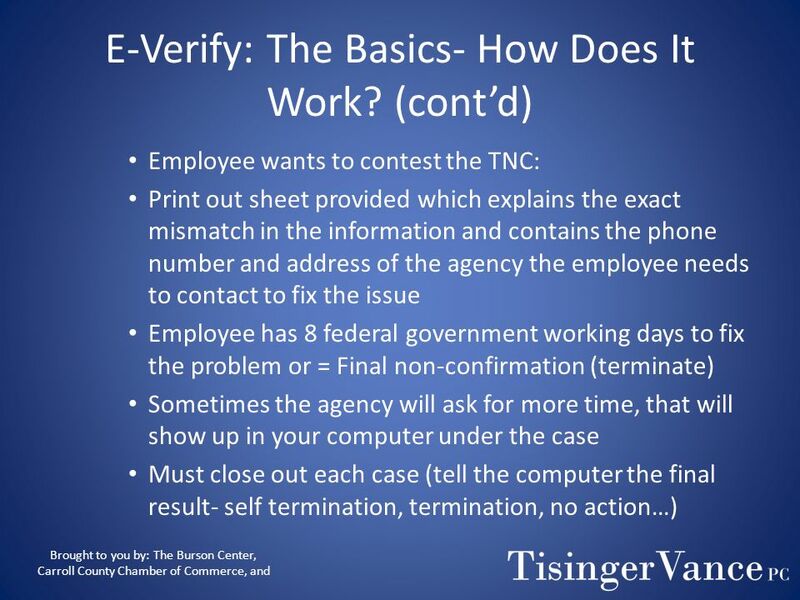 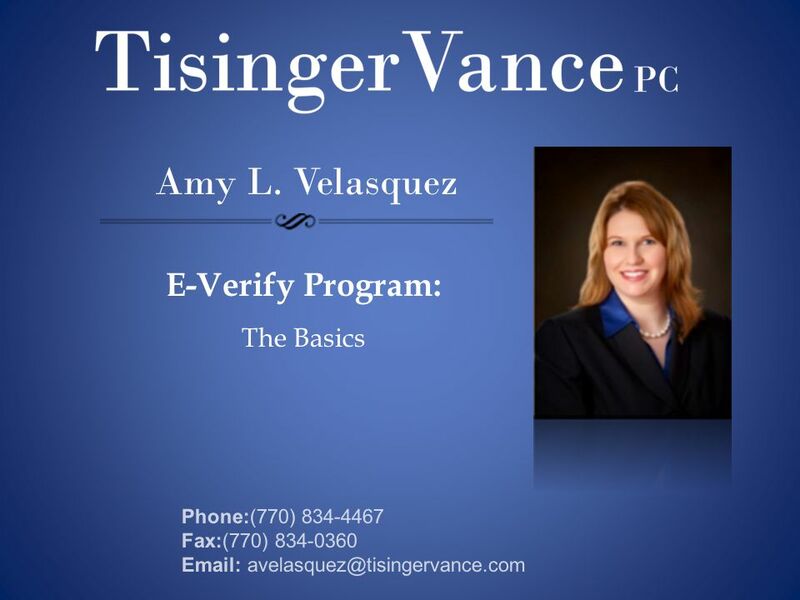 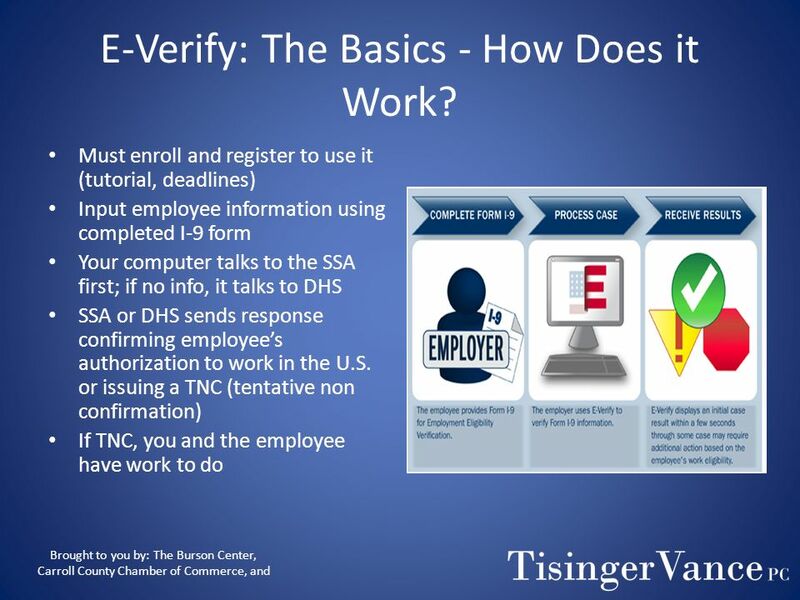 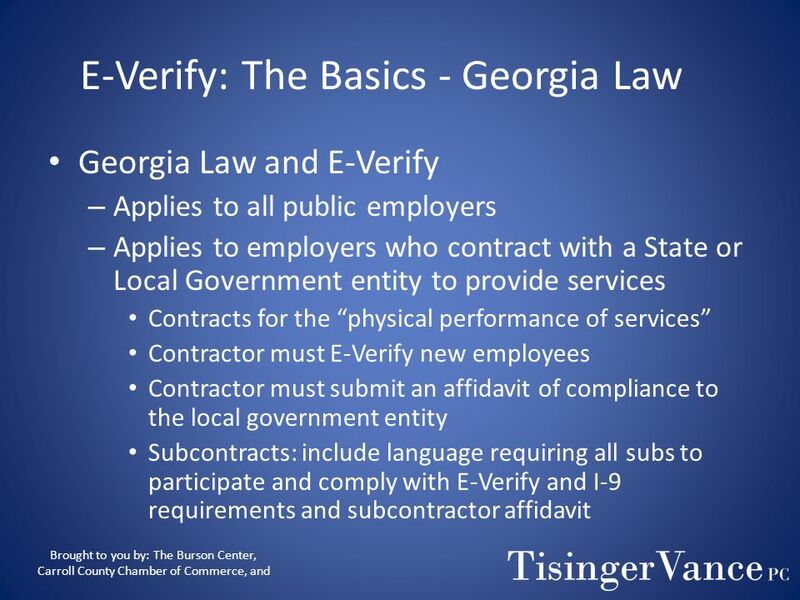 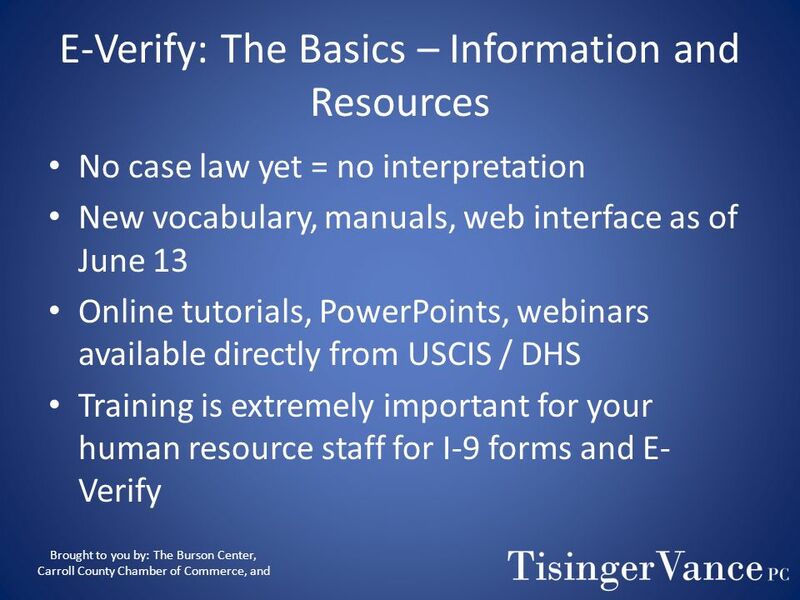 77 E-Verify: The Basics - How Does it Work? 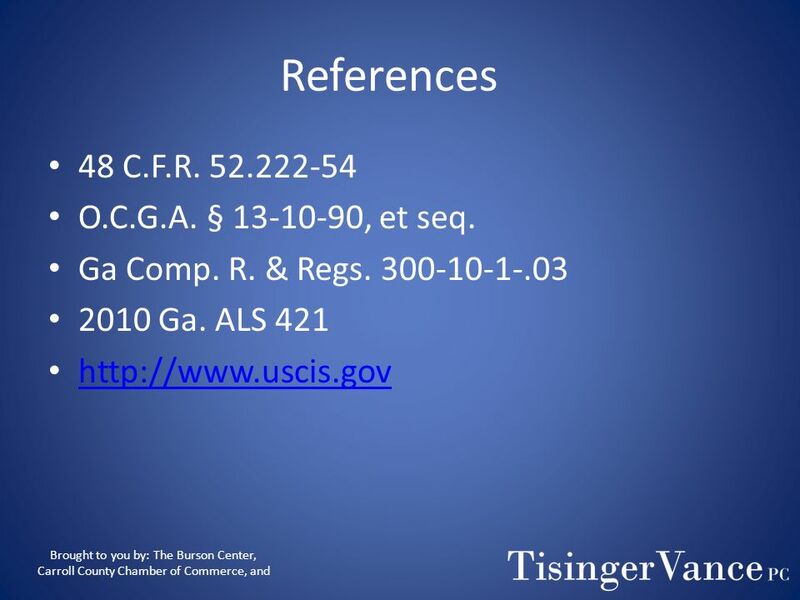 83 References 48 C.F.R. 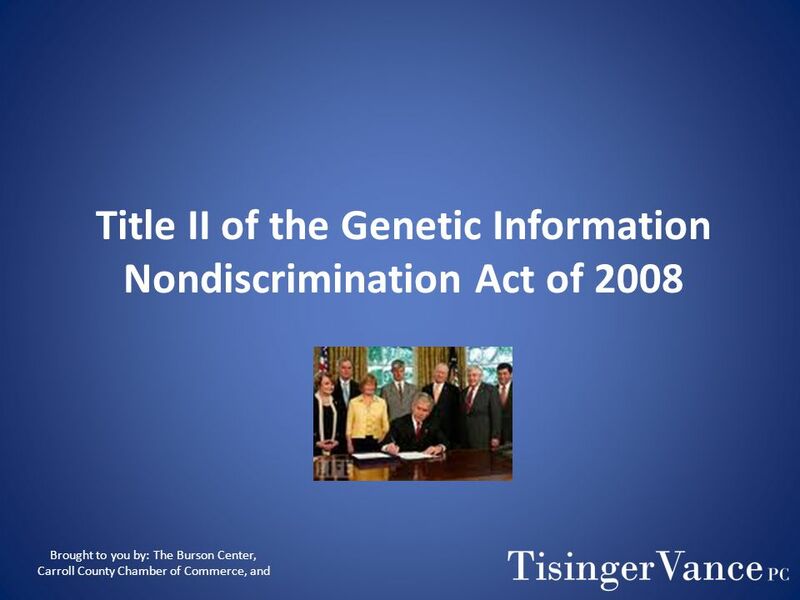 52.222-54 O.C.G.A. 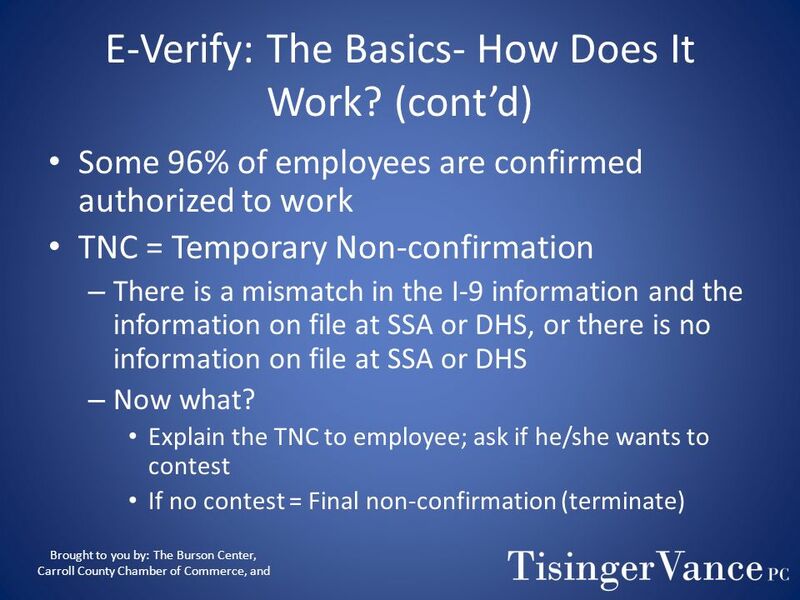 § 13-10-90, et seq. 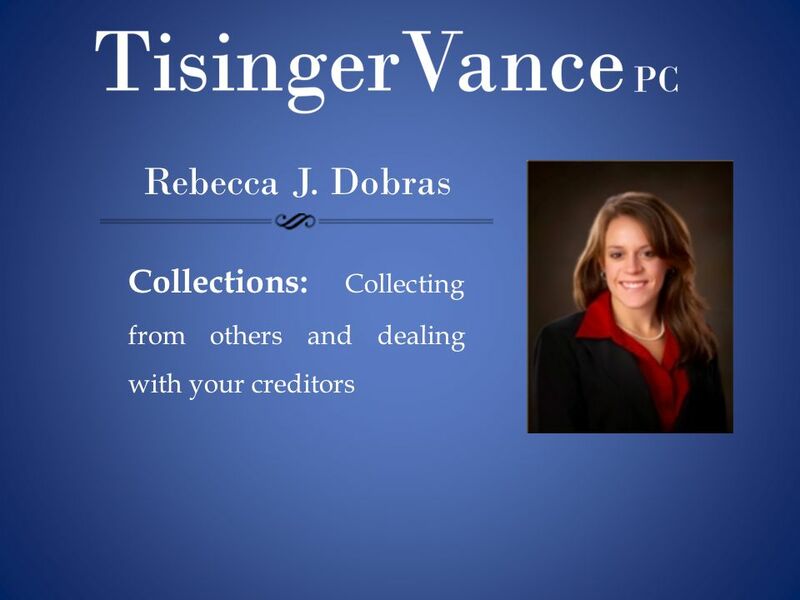 Nice looking person Obvious she has a lot of money You might think: I will have no trouble get paid back from this lady! 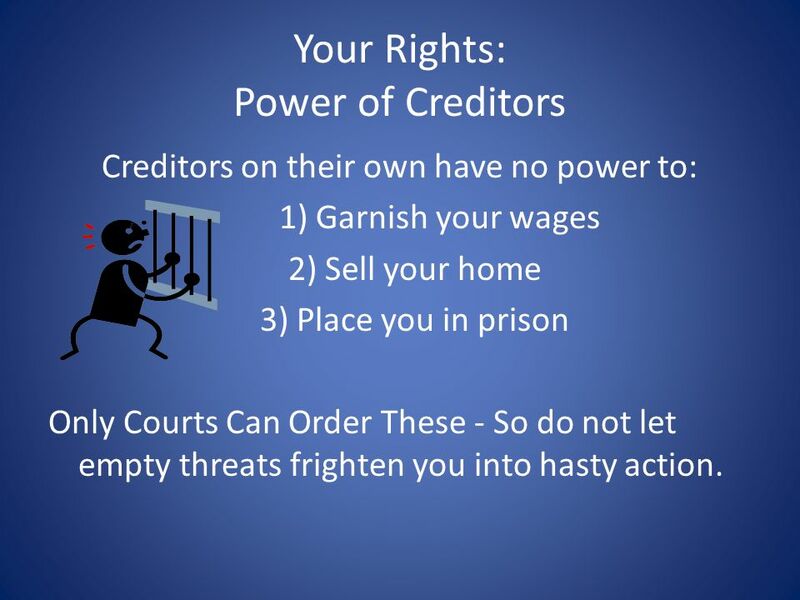 Run a Credit Check Get all important information Address, Phone Numbers, Where employed Does the individual have authority to do this? 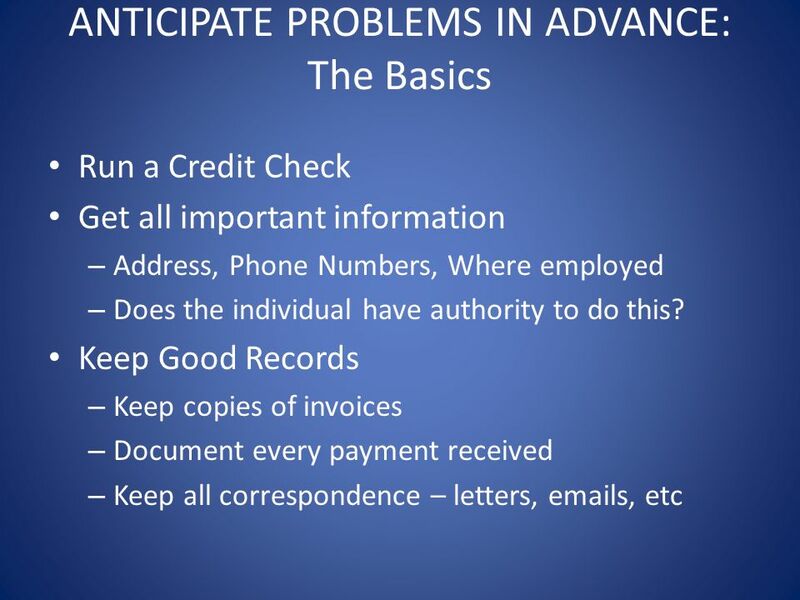 Keep Good Records Keep copies of invoices Document every payment received Keep all correspondence – letters, s, etc Credit Check: You will be able to find out if this individual has had trouble paying debts in the past. 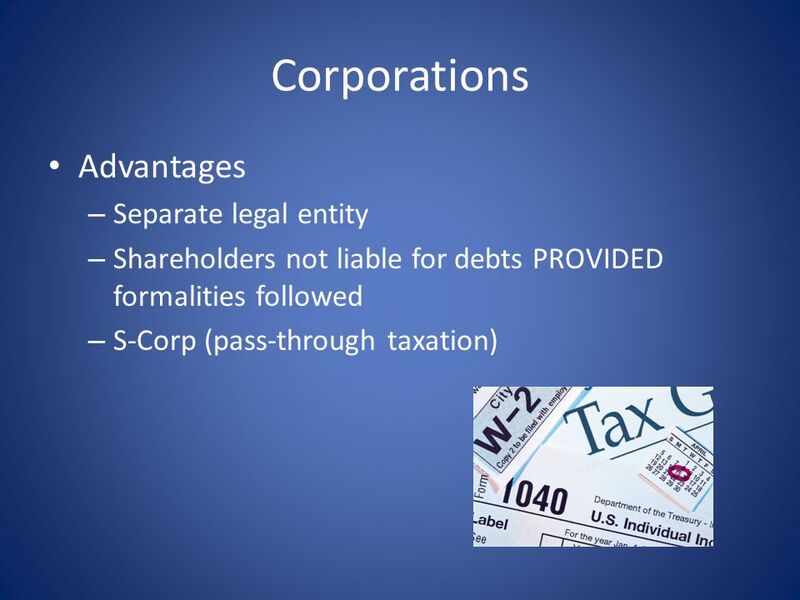 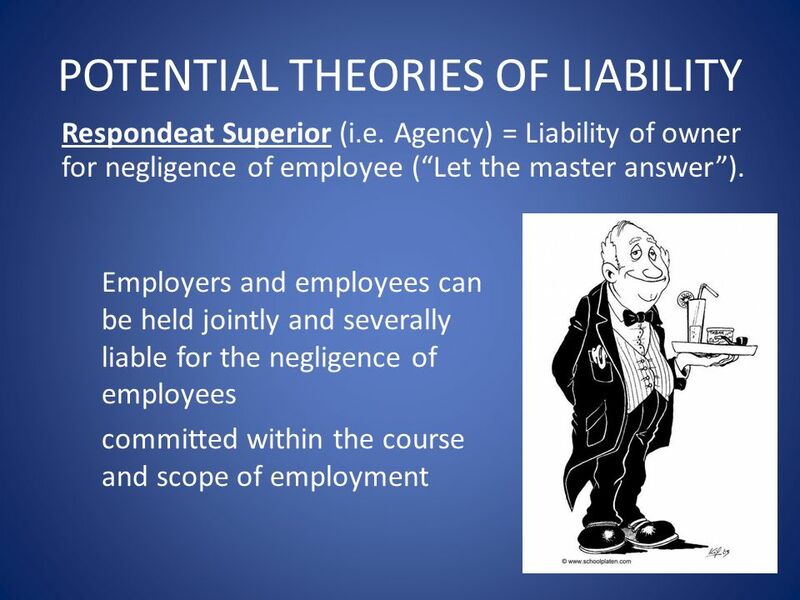 Maybe you will decide it is not worth doing business with this individual Authority: If the individual is working for a company, you need to make sure the individual has the authority to bind the company – that he is in fact an agent of the company and has permission to do this. 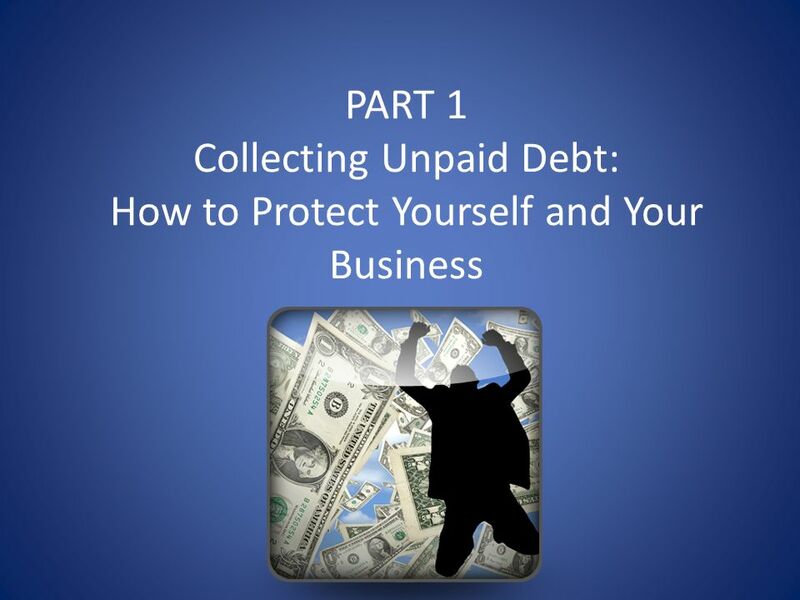 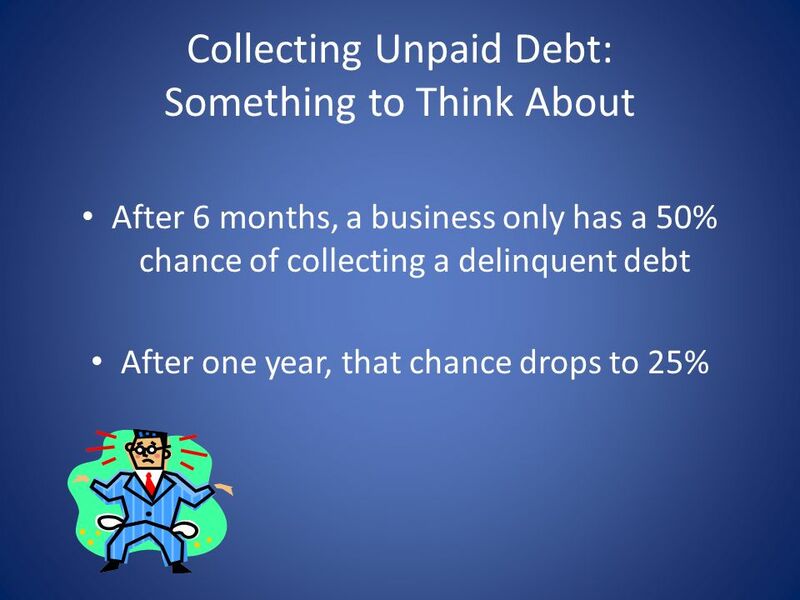 If the individual is lacking authority, you will NOT be able to go after the company for the unpaid debt. 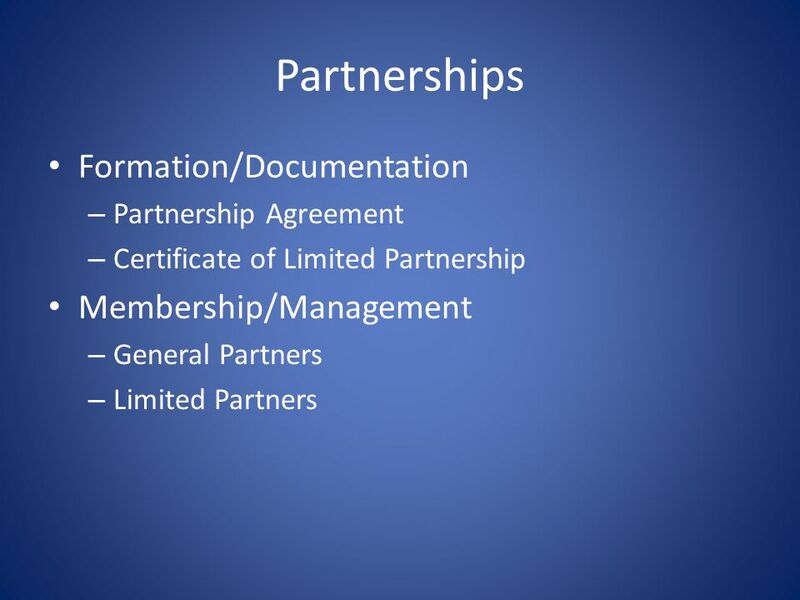 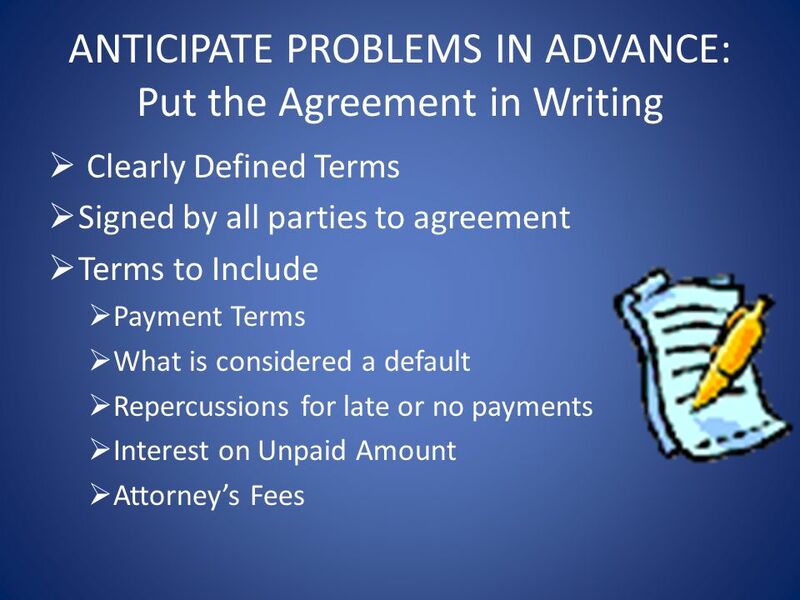 Clearly Defined Terms Signed by all parties to agreement Terms to Include Payment Terms What is considered a default Repercussions for late or no payments Interest on Unpaid Amount Attorney’s Fees Clearly Defined: So both parties know exactly what is expected of them; Know rights and obligations Payment Terms: When Due, How Much, Grace Period? 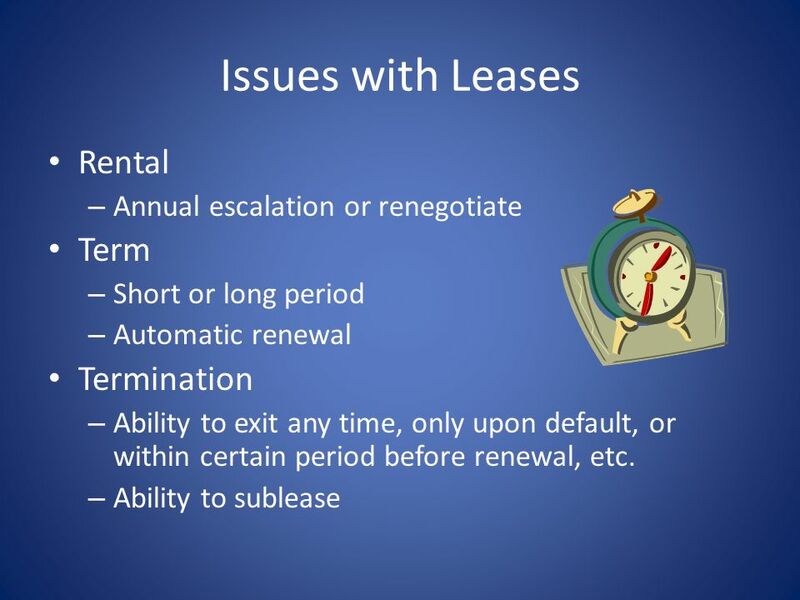 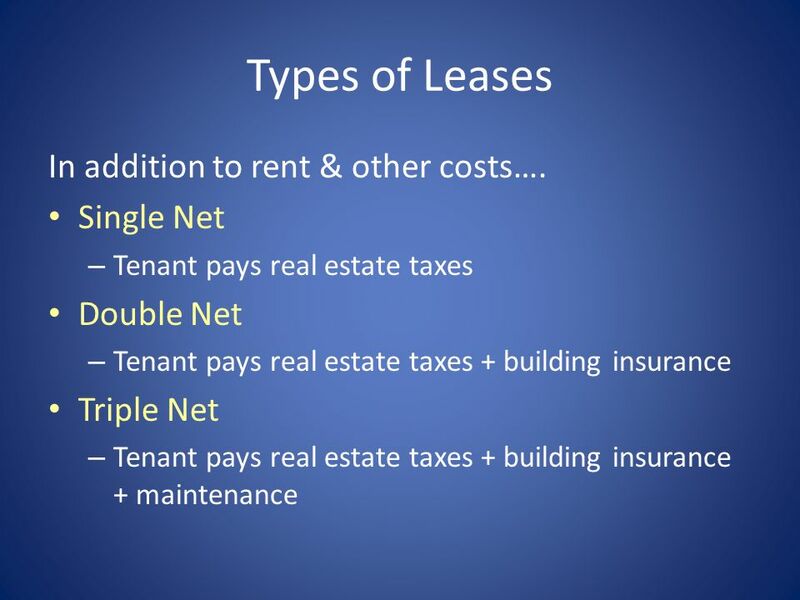 Repercussions: Such as late fees Interest: At what rate? 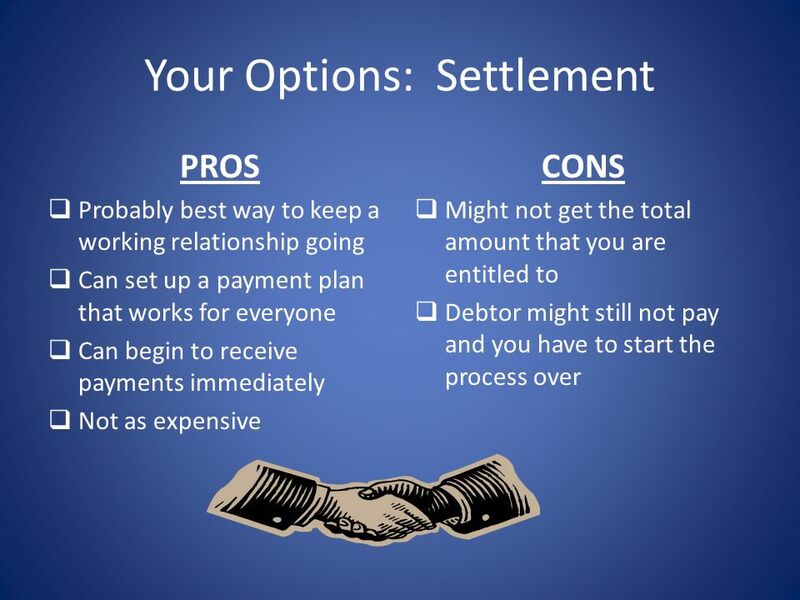 How it is calculated If not specified in the agreement: Legal rate of interest is 7% per annum If the amount is for less than $3000, the rate you specify cannot be more than 16% per annum More than $3000, the rate can just be negotiated The criminal rate (cannot exceed) is 5% per month or 60% APR Attorney’s Fees: You may entitled to attorney’s fees if the client defaults on payments and you must hire an attorney to collect the money. 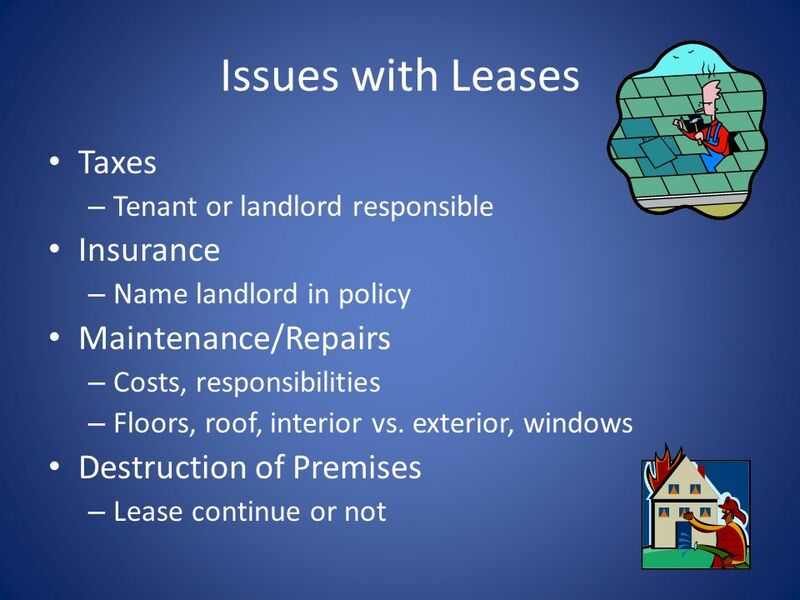 But it needs to be included in K. May not exceed 15% of the principal and interest owed. 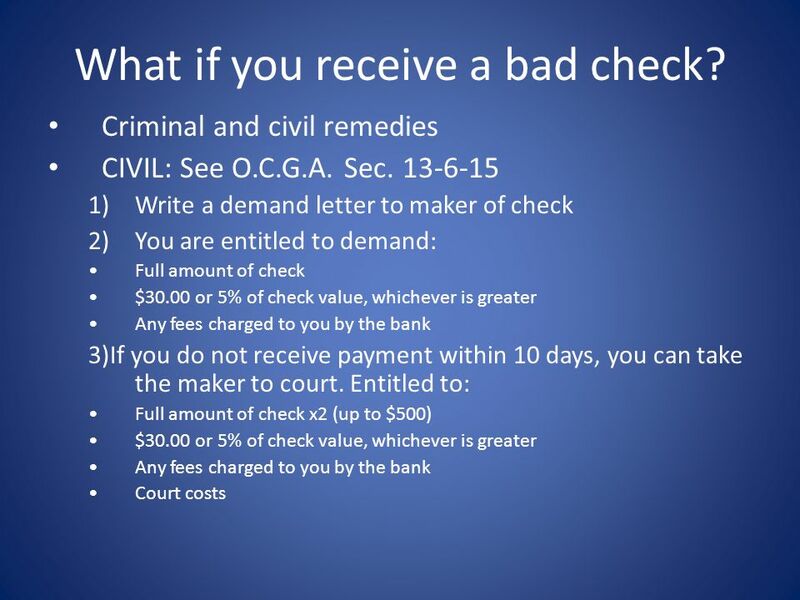 92 What if you receive a bad check? 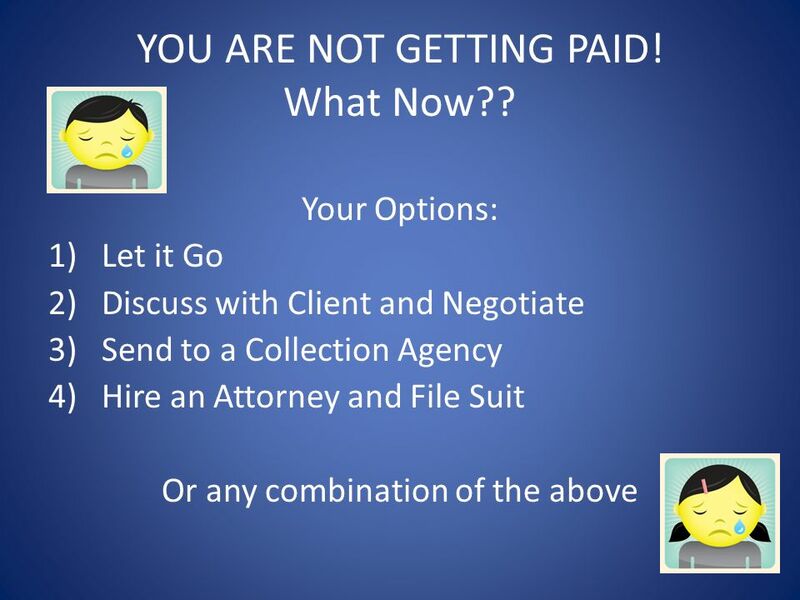 93 YOU ARE NOT GETTING PAID! 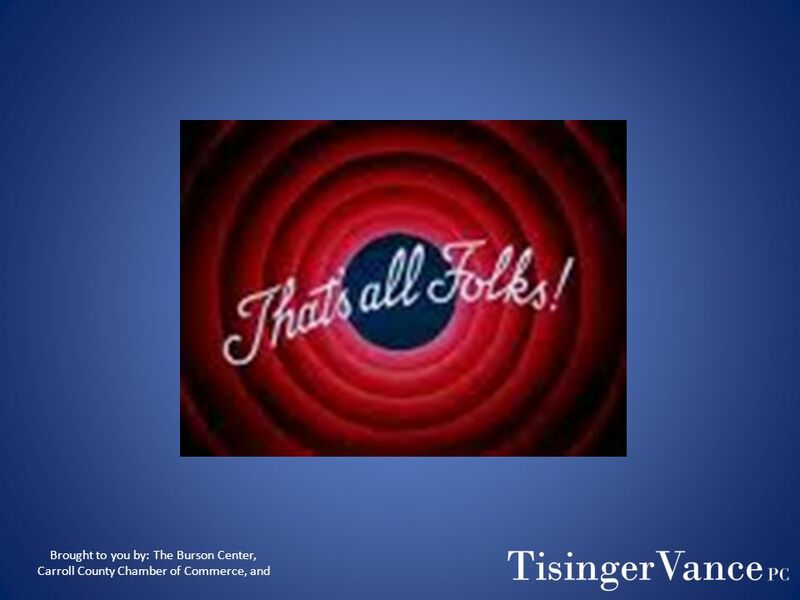 What Now?? 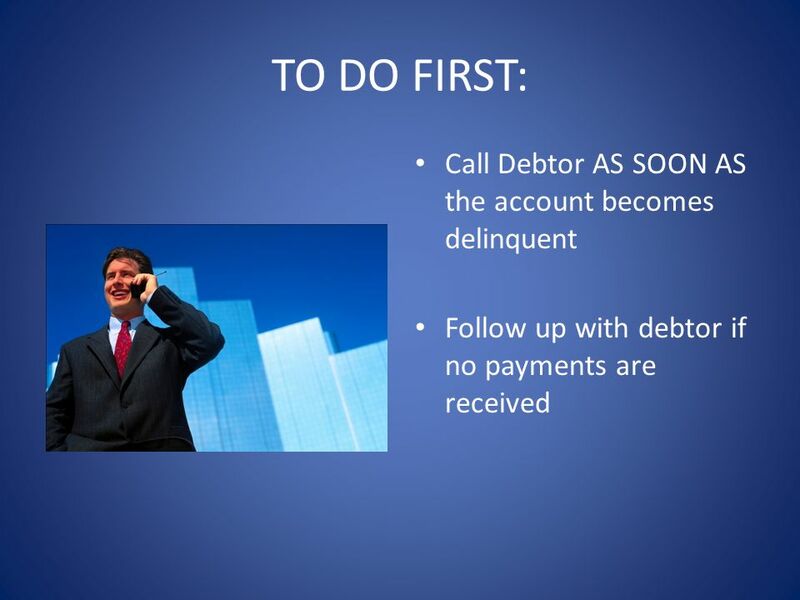 Follow up with debtor if no payments are received Call: Courtesy to let them know the account is delinquent. 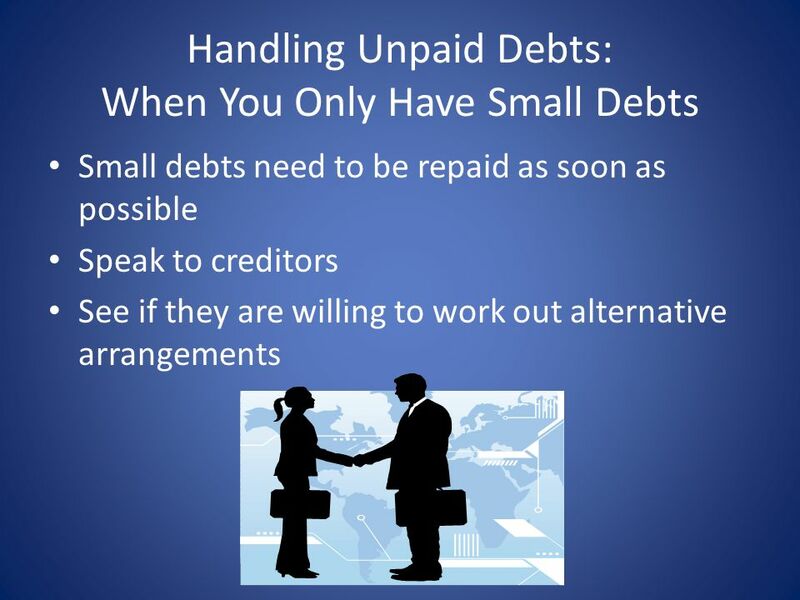 Give them a chance to explain and correct the problem. 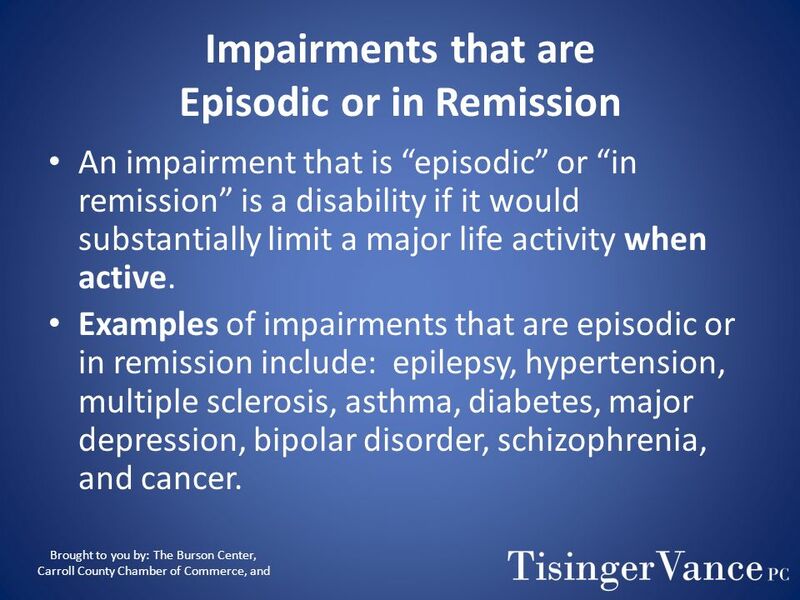 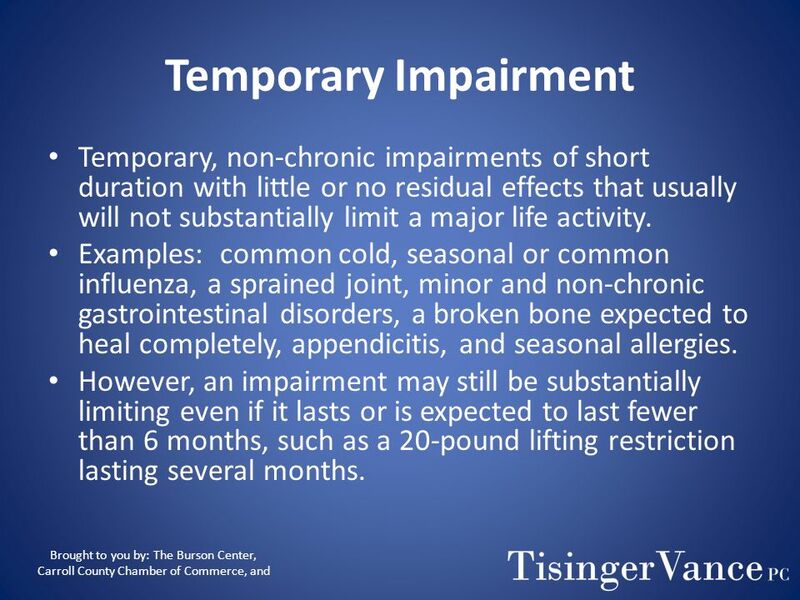 Explain your potential remedies. 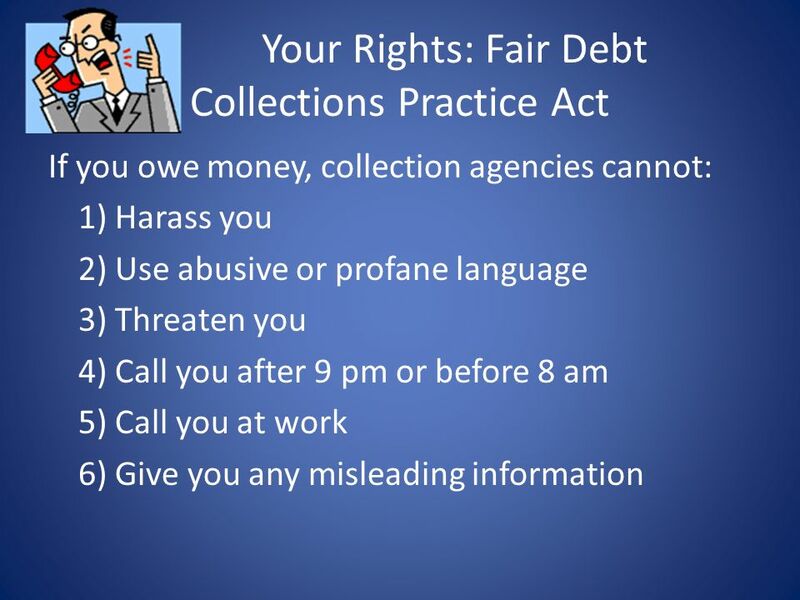 PROS Will harm debtor’s credit score Can be more aggressive in collection efforts than you may have time to CONS Most agencies take a portion of the amount owed as their fee Collection agencies cannot garnish wages, foreclose on house, place liens on property etc Subject to the Fair Debt Collections Practices Act Credit Score: Maybe the this threat will frigthen debtor into paying or settling Cannot: Only courts can do these things. 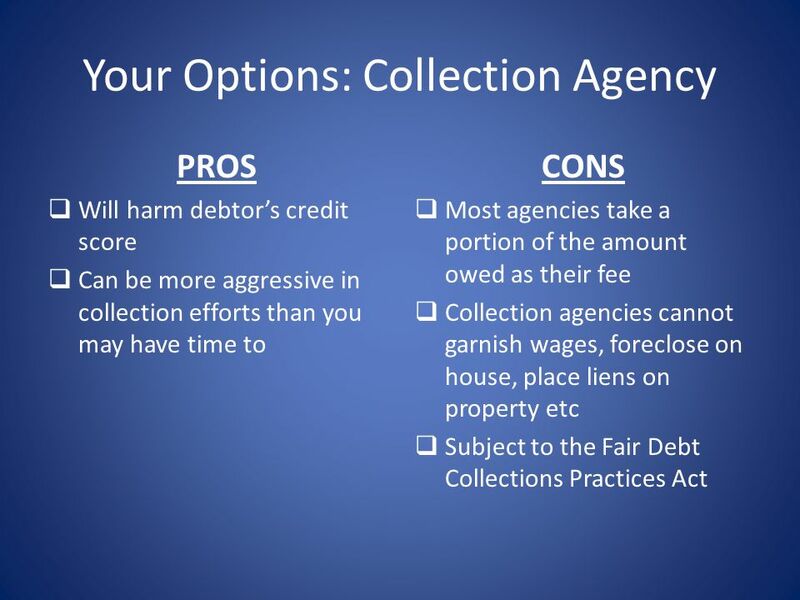 Collection agencies can only demand payments be made FDCPA: Places many limits on what a collection agency will do. 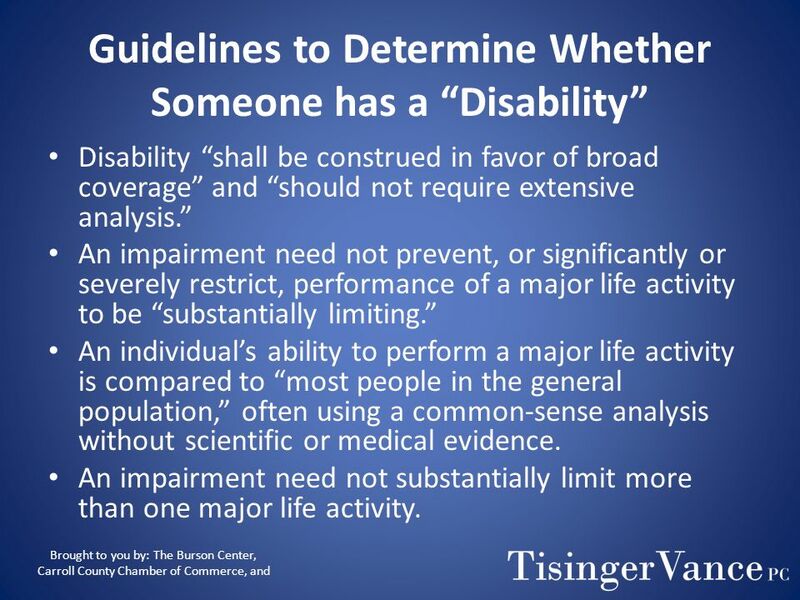 Will discuss this more in the a bit later. 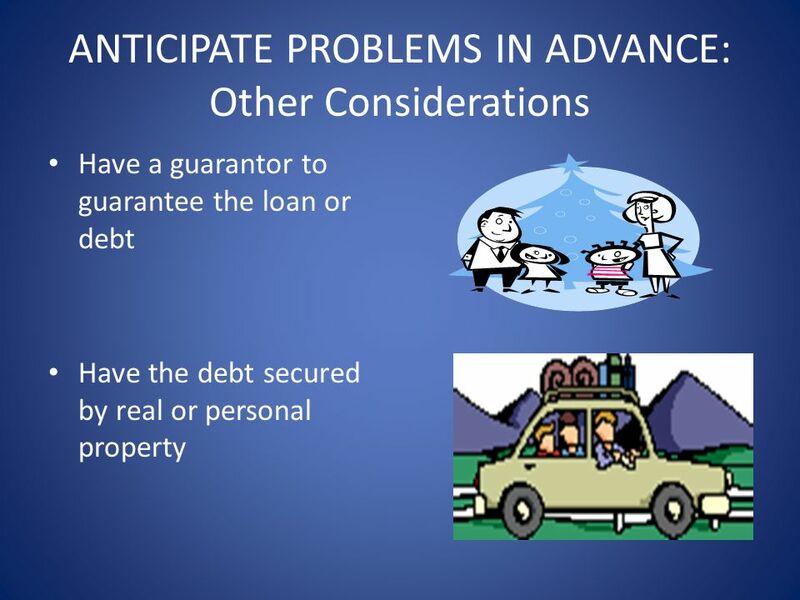 101 Do NOT ignore the problem and hope it disappears!! 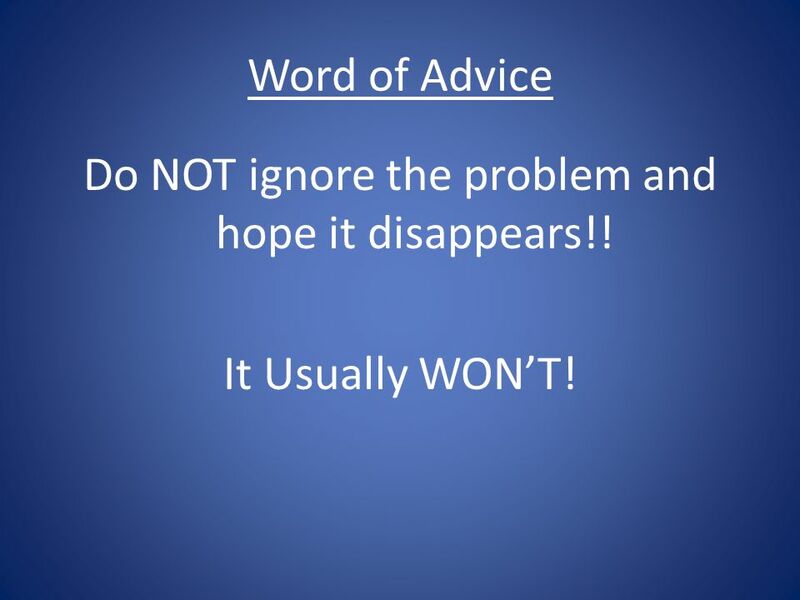 Word of Advice Do NOT ignore the problem and hope it disappears!! 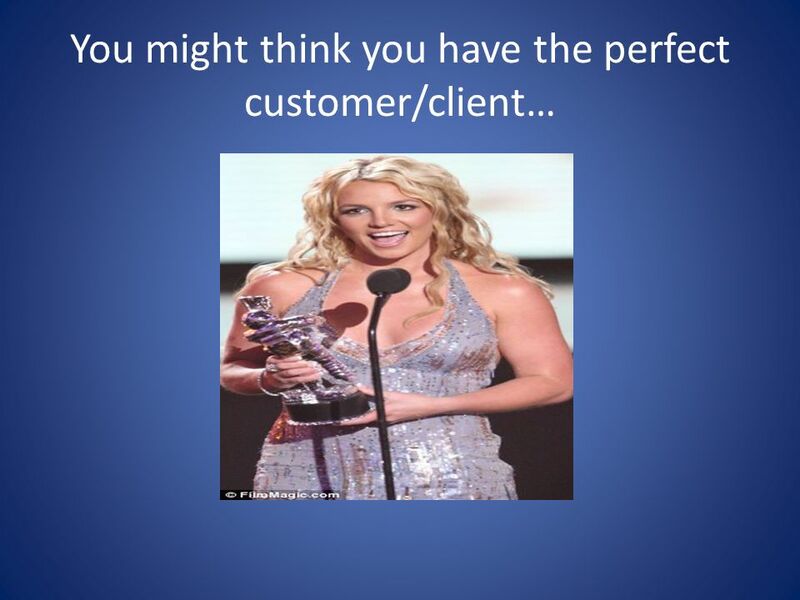 It Usually WON’T! 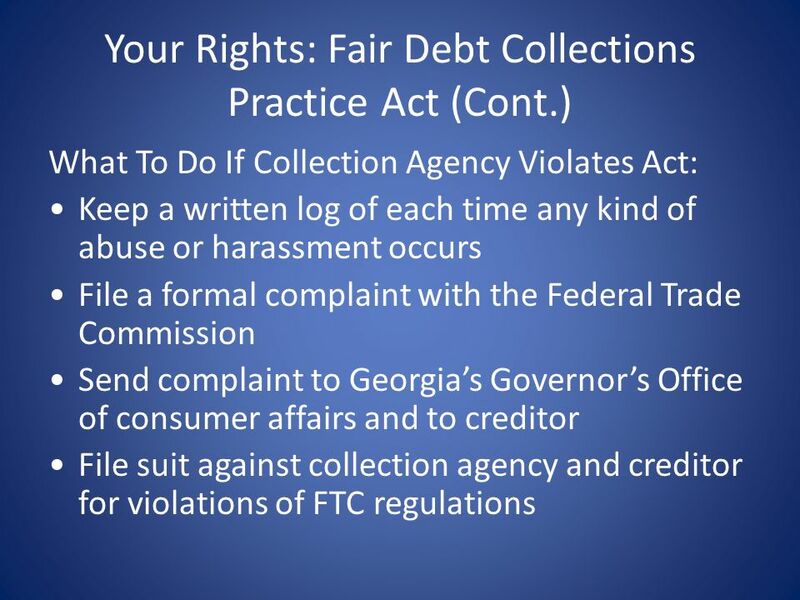 What To Do If Collection Agency Violates Act: Keep a written log of each time any kind of abuse or harassment occurs File a formal complaint with the Federal Trade Commission Send complaint to Georgia’s Governor’s Office of consumer affairs and to creditor File suit against collection agency and creditor for violations of FTC regulations Suit: FDCPA is a strict liability law, which means you do not have to prove actual damages. 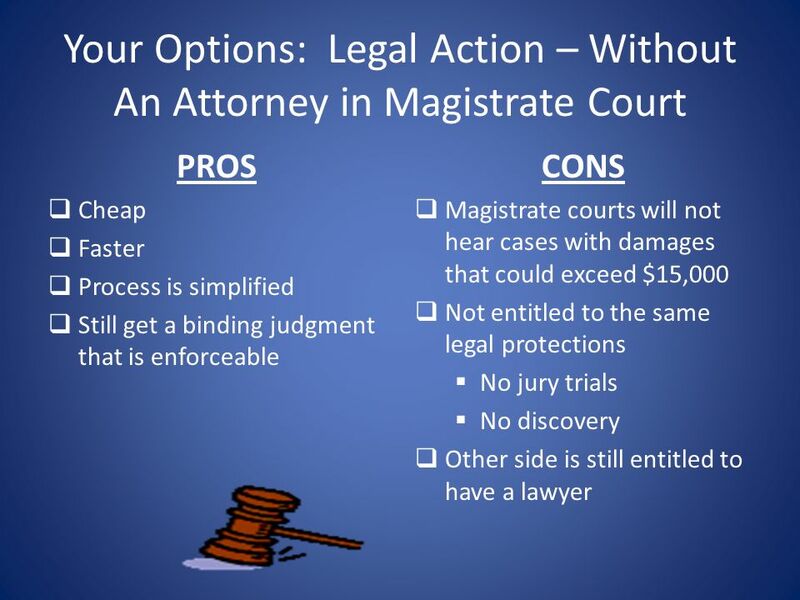 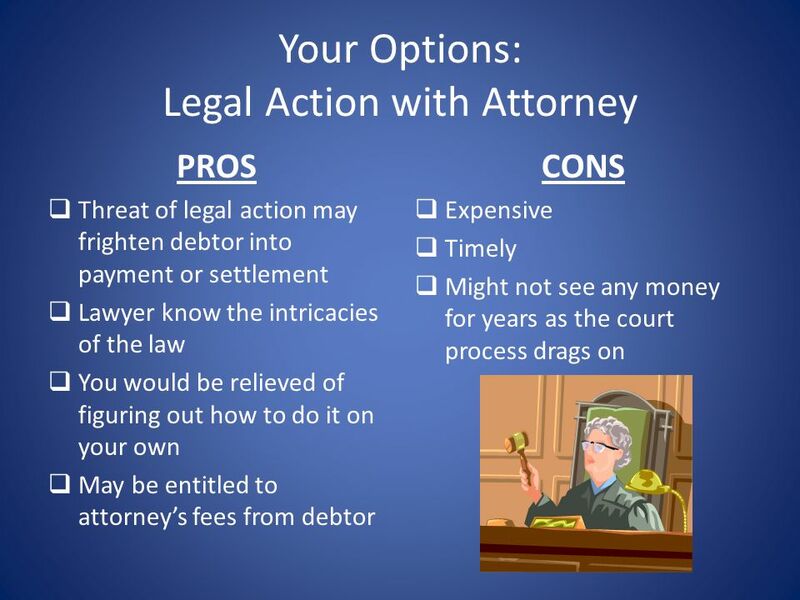 You are entitled to statutory damages up to $1000 plus reasonable attorney’s fees. 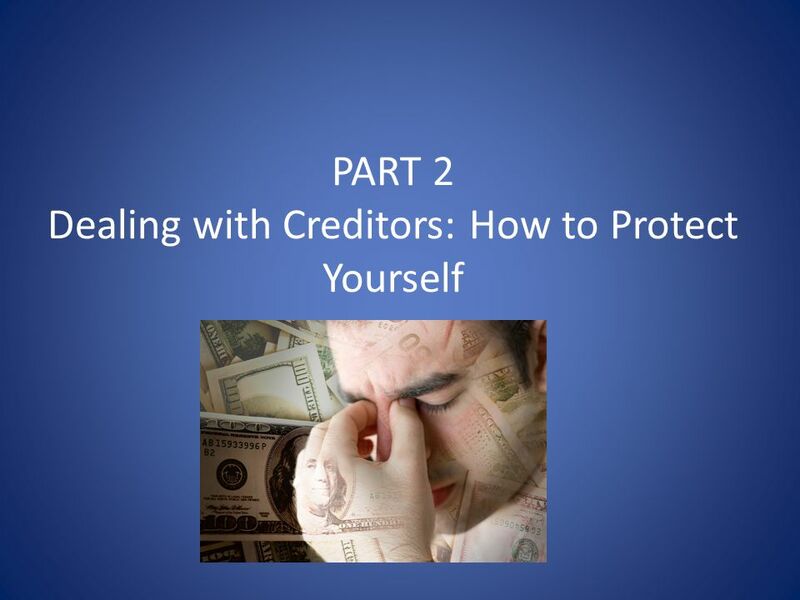 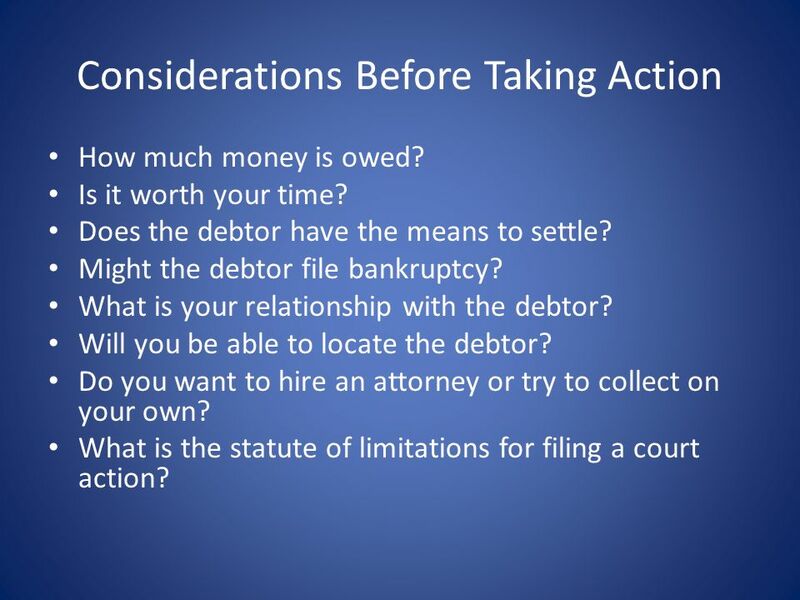 Do not try to pay off large debts in their entirety as fast as possible Your Options 1) Speak to creditors directly 2) Talk to a debt settlement agency or a lawyer to negotiate on your behalf 3) Bankruptcy Will strip you of savings and emergency resources that you might need in the future. 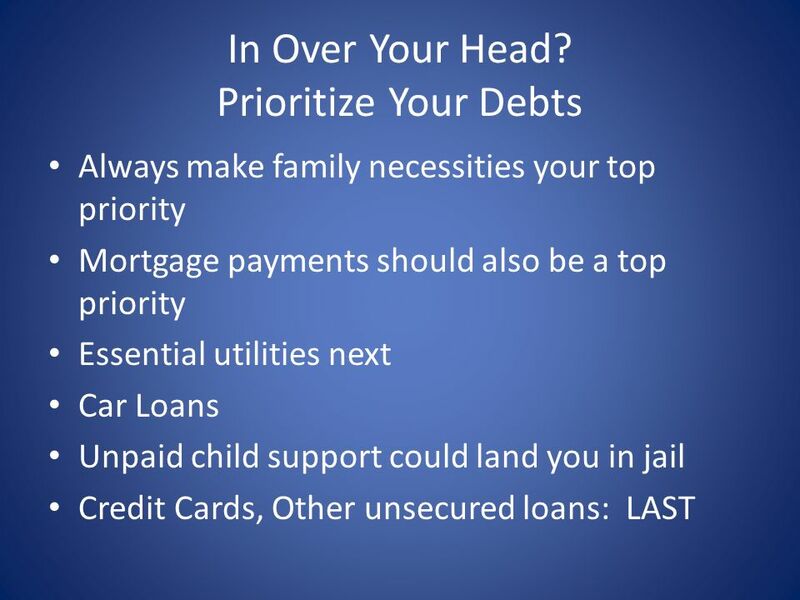 Causing you to only get in over your head even more. 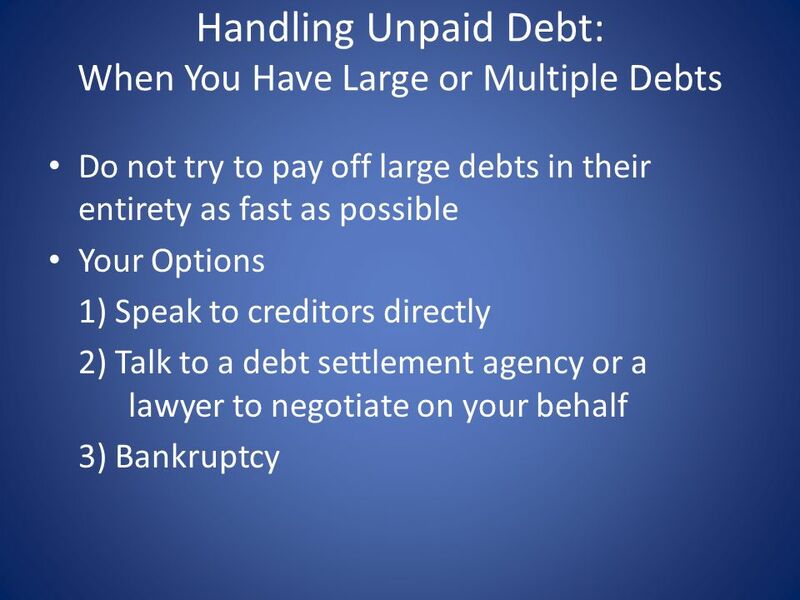 Speak to Creditors: See if they are willing to work out some kind of alternative arrangements They can help negotiate on you behalf to get payments, interest rates, and fees frozen or reduced NOTE: Debt settlement through an agency will negatively affect your credit for 7-10 years 3) Bankruptcy: If you have insurmountable debt that you cannot overcome, bankruptcy might be the best option for you Chapter 7: Unsecured debt is eliminated Chapter 13: Sets up a repayment plan over 3-5 years If this is an option you are considering, you definitely need to talk to a bankruptcy attorney. 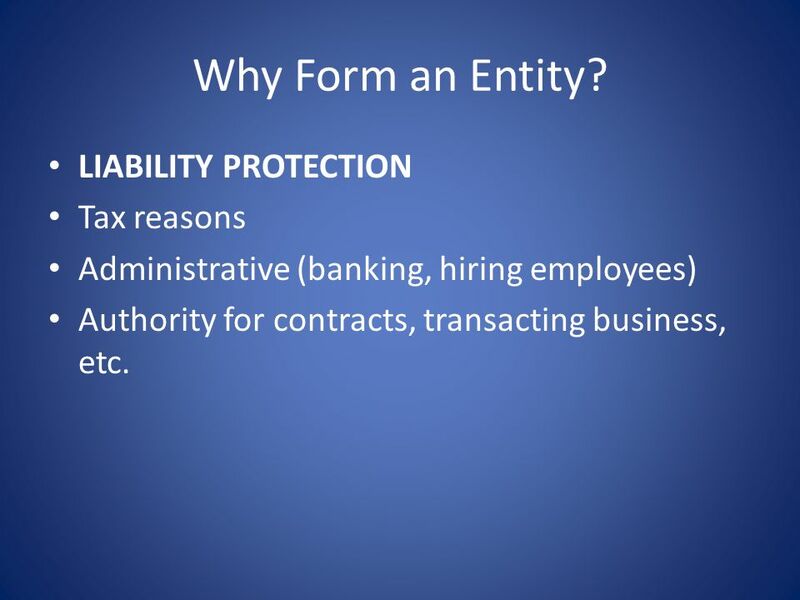 Administrative (banking, hiring employees) Authority for contracts, transacting business, etc. 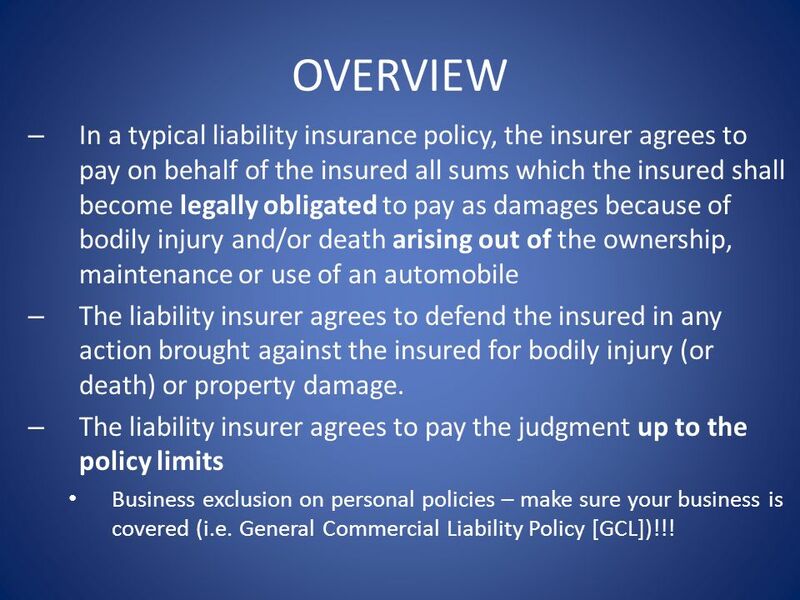 128 OVERVIEW In a typical liability insurance policy, the insurer agrees to pay on behalf of the insured all sums which the insured shall become legally obligated to pay as damages because of bodily injury and/or death arising out of the ownership, maintenance or use of an automobile The liability insurer agrees to defend the insured in any action brought against the insured for bodily injury (or death) or property damage. 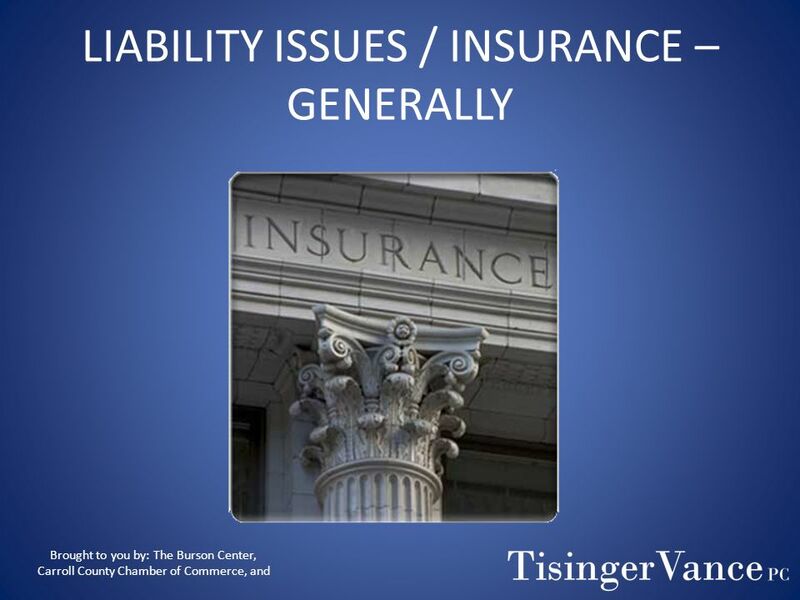 The liability insurer agrees to pay the judgment up to the policy limits Business exclusion on personal policies – make sure your business is covered (i.e. 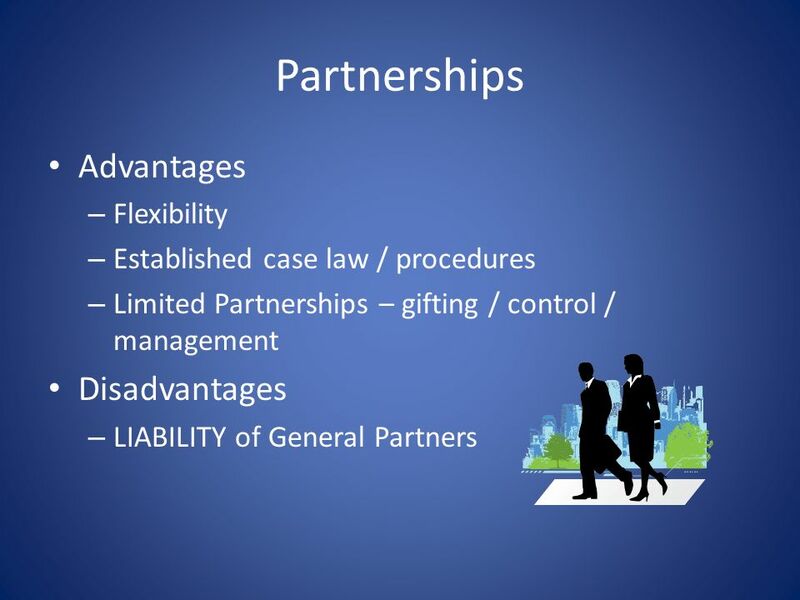 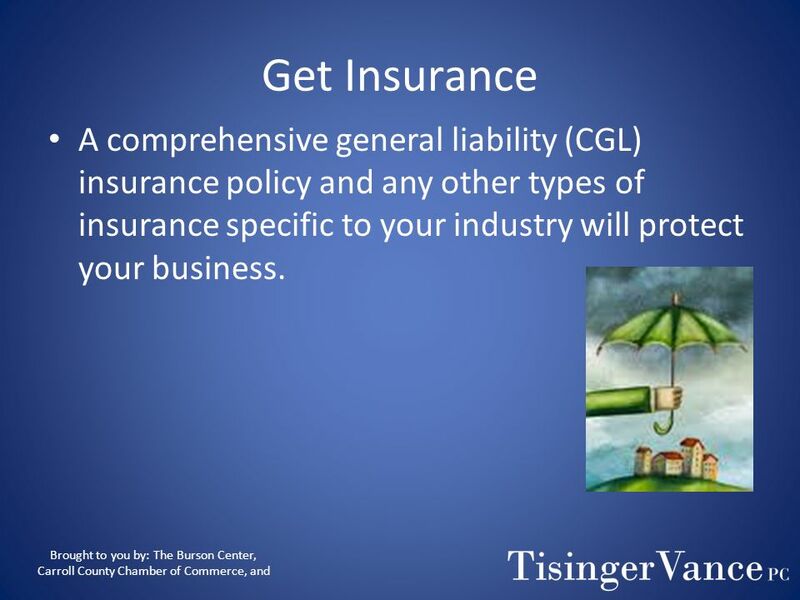 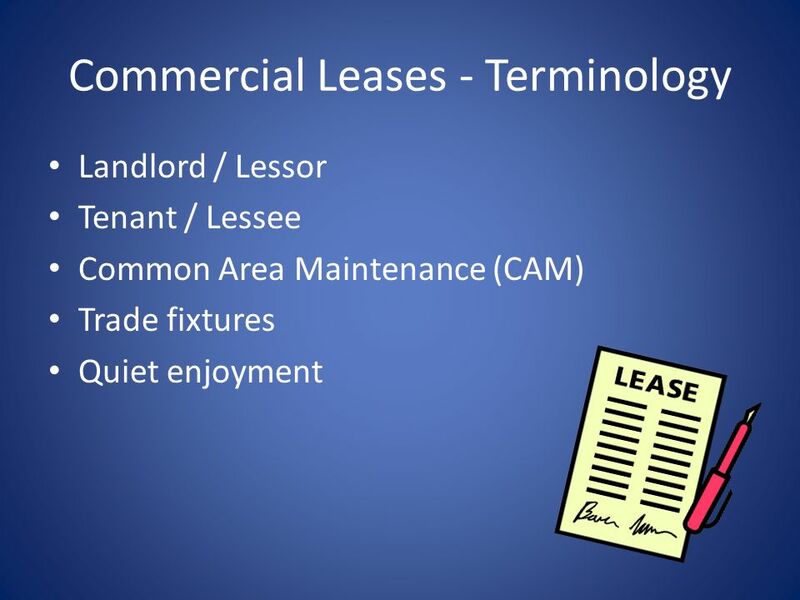 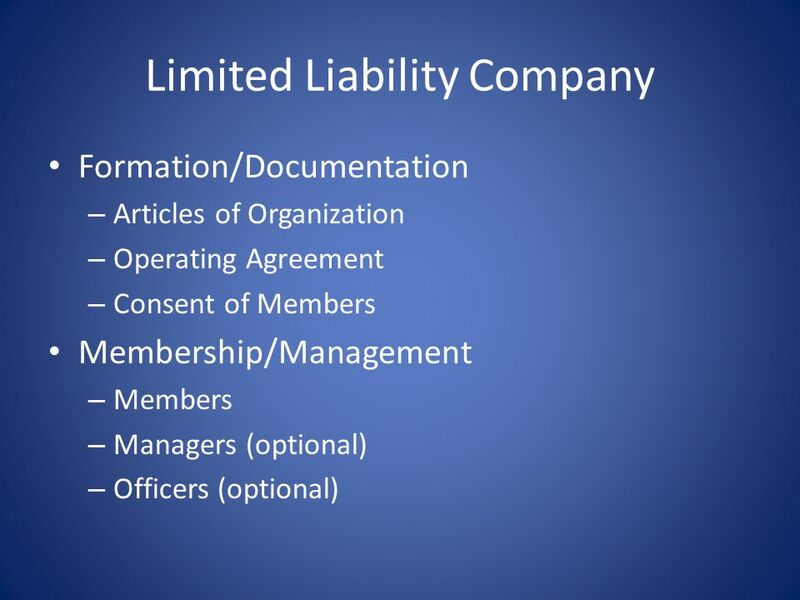 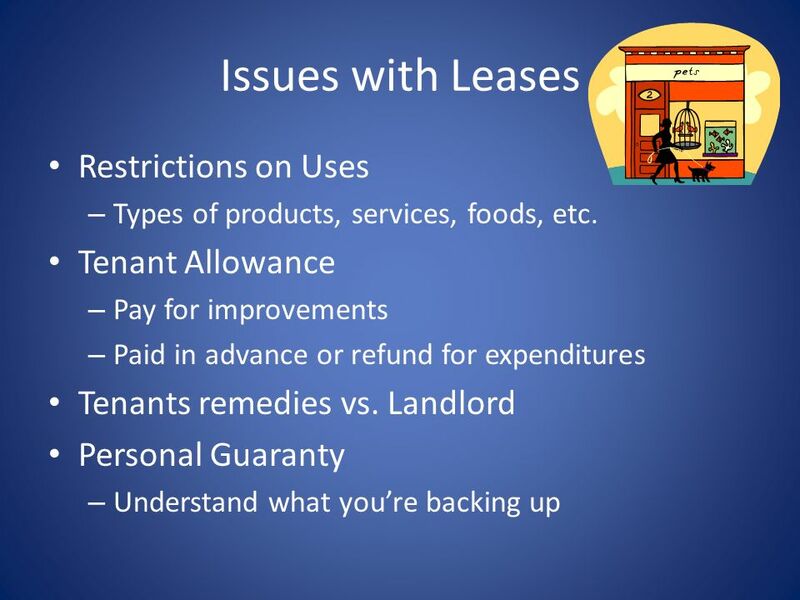 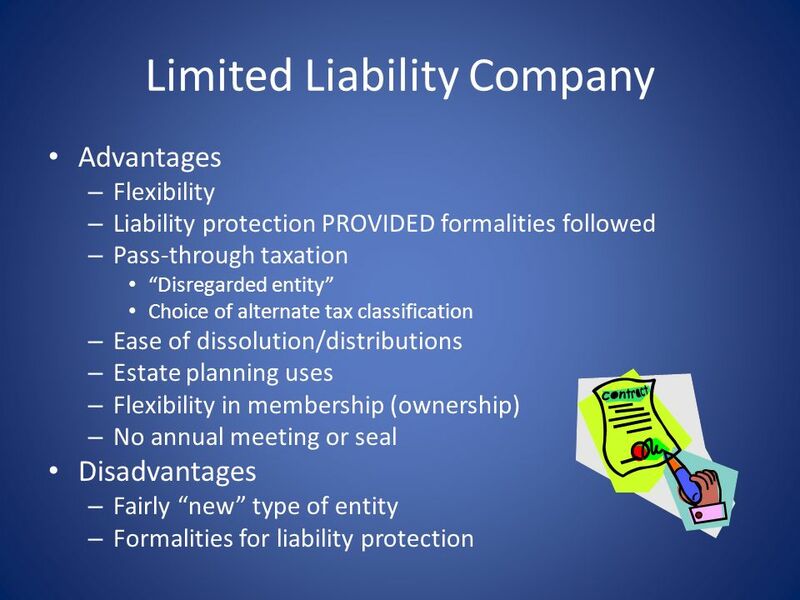 General Commercial Liability Policy [GCL])!!! 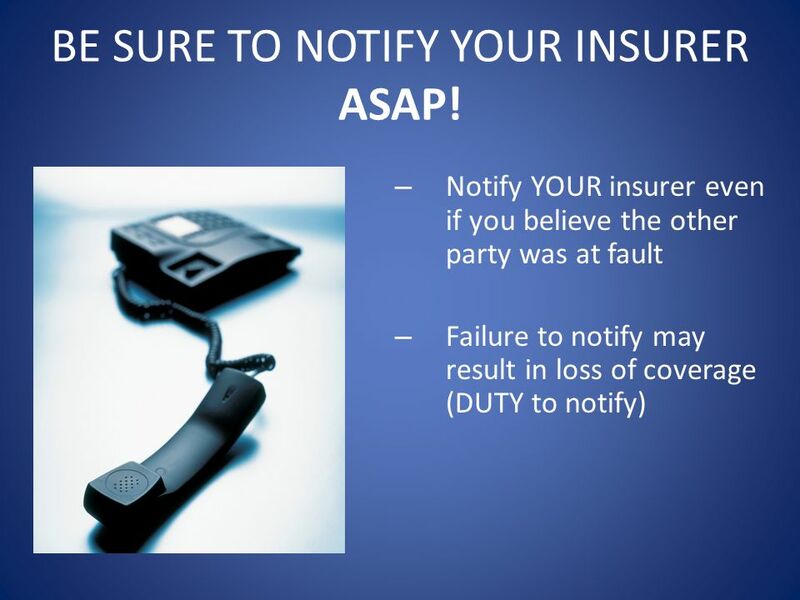 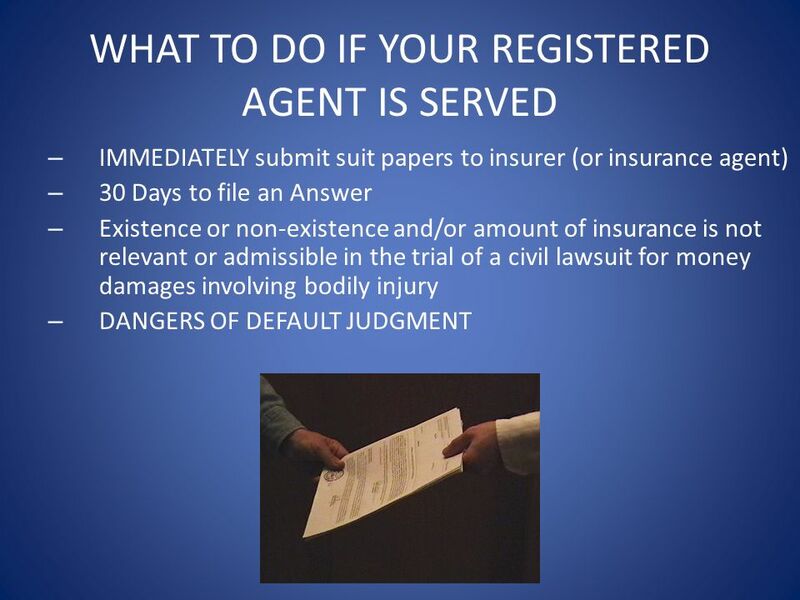 133 BE SURE TO NOTIFY YOUR INSURER ASAP! 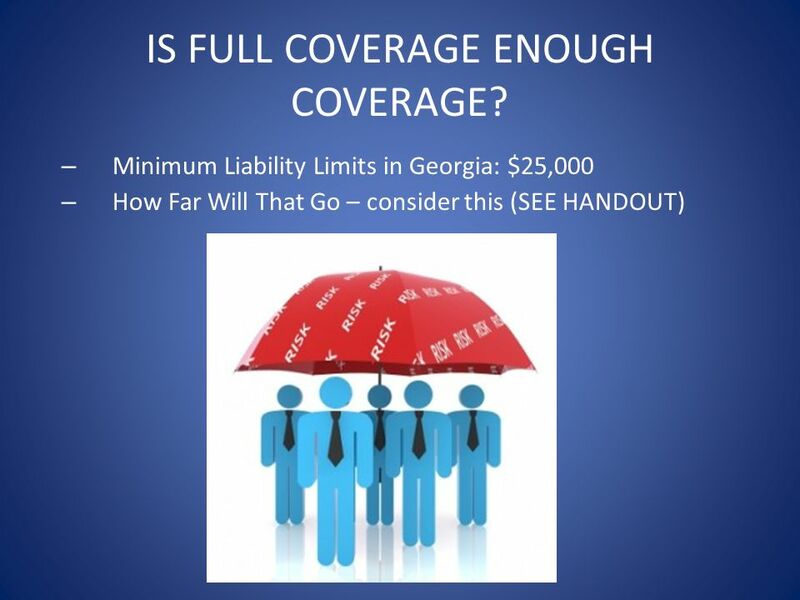 135 IS FULL COVERAGE ENOUGH COVERAGE? 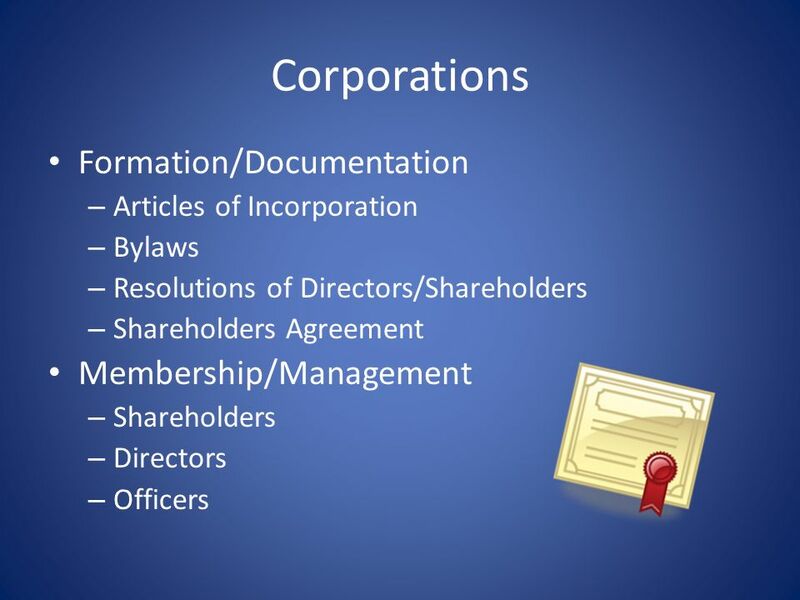 Download ppt "Breakfast and Business Law"
Civil & criminal law Civil Law. 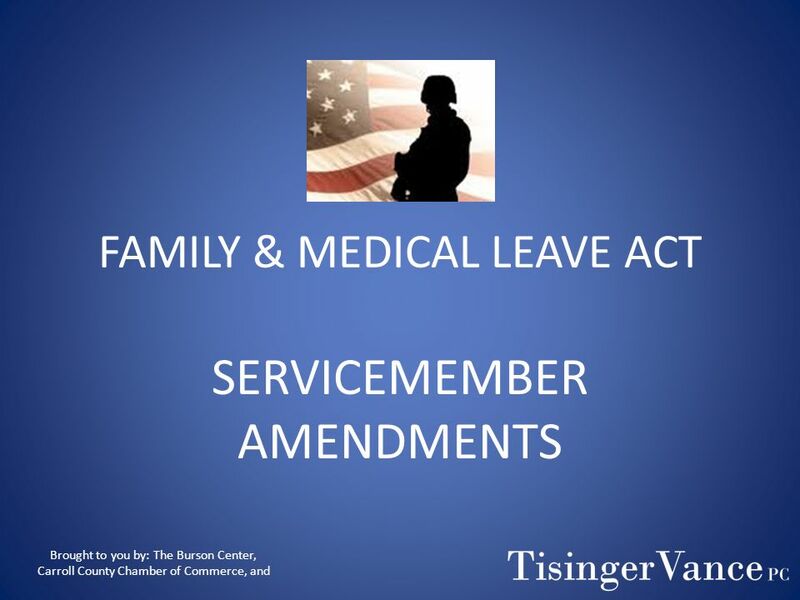 Family Medical Leave Act 1. 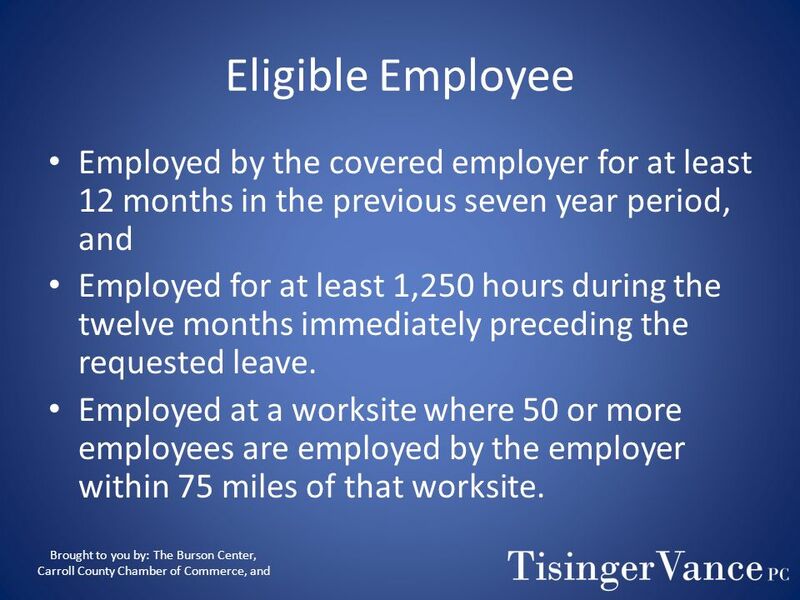 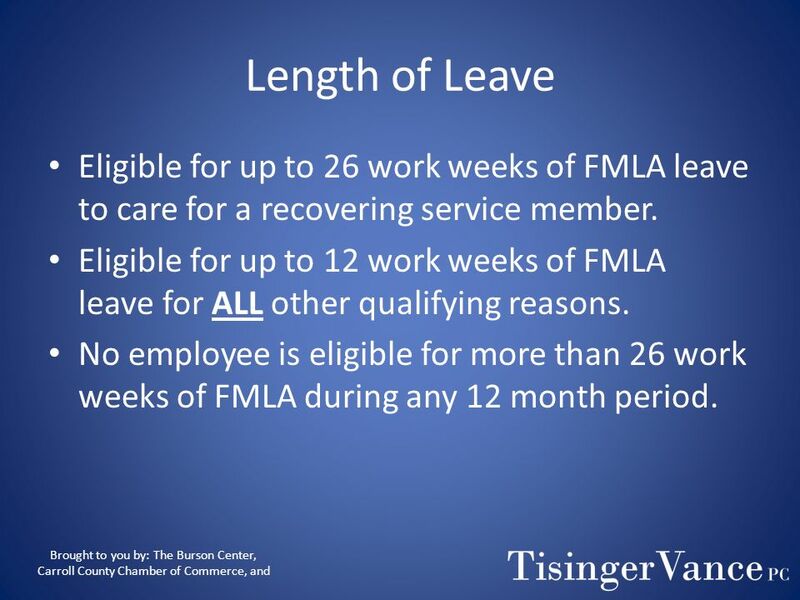 Purpose The Family Medical Leave Act (“FMLA”) entitles eligible employees to take twelve weeks of unpaid, job protected leave. 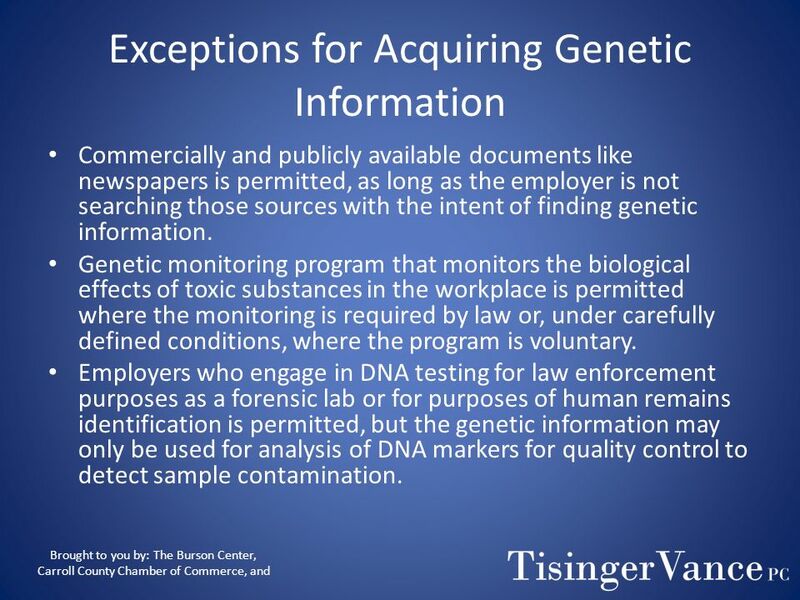 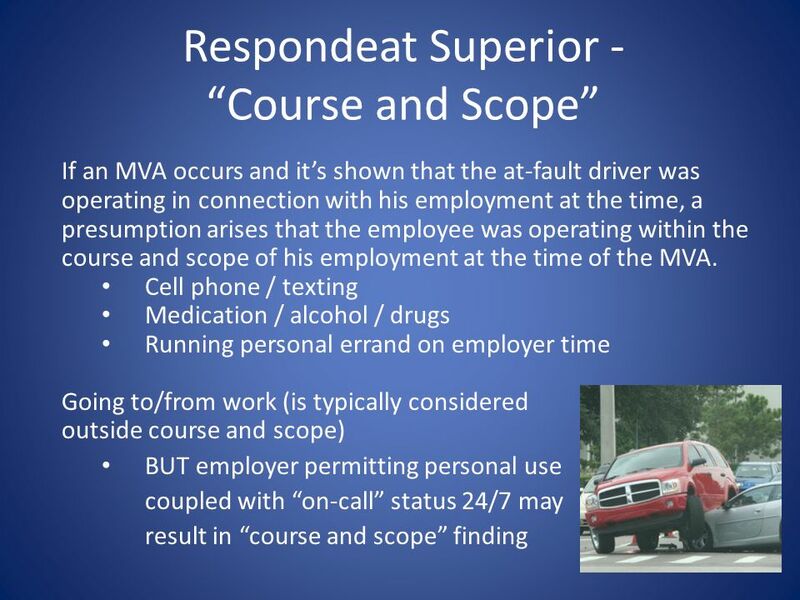 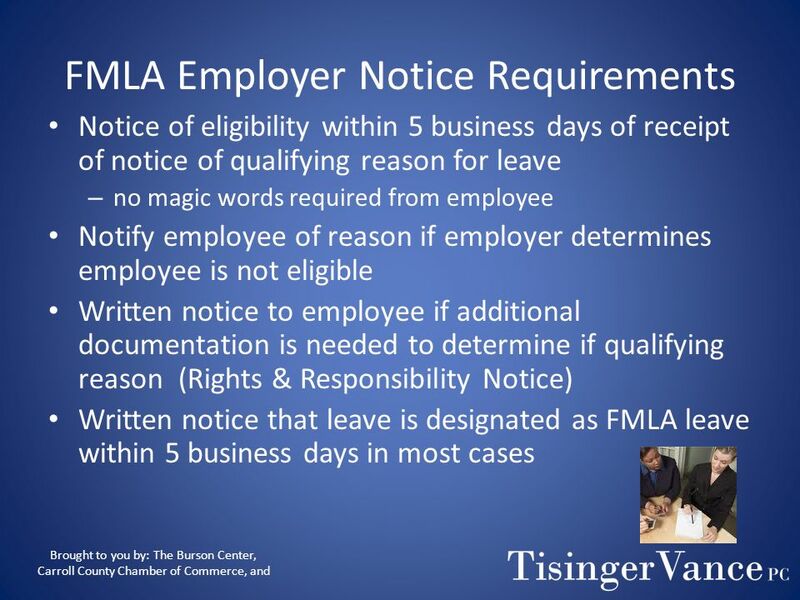 FMLA What Supervisors Need to Know. 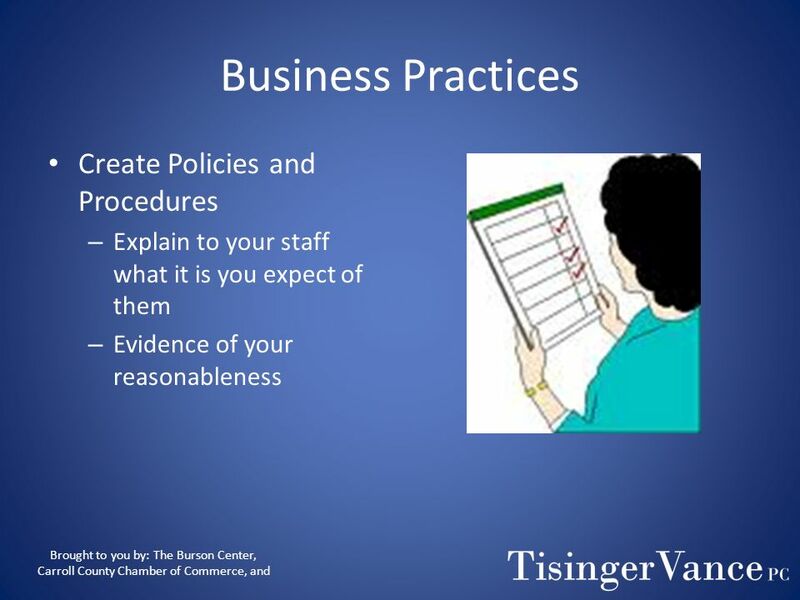 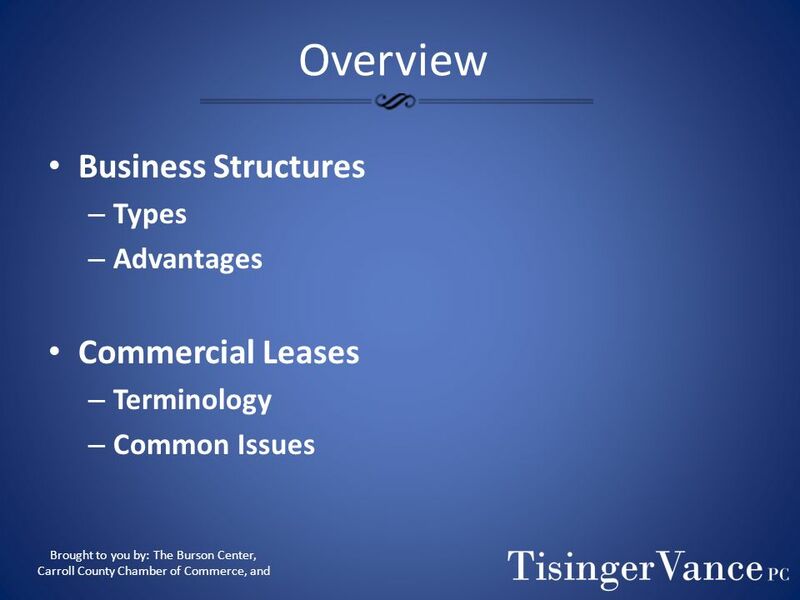 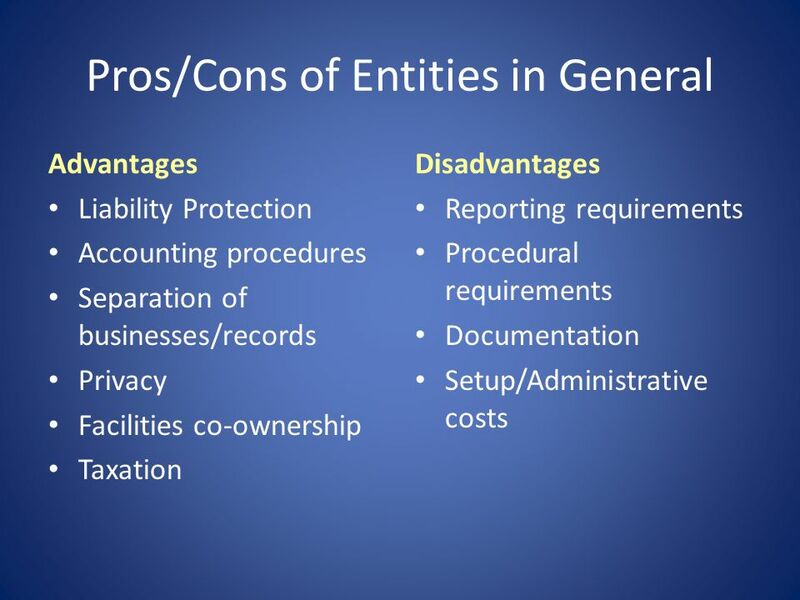 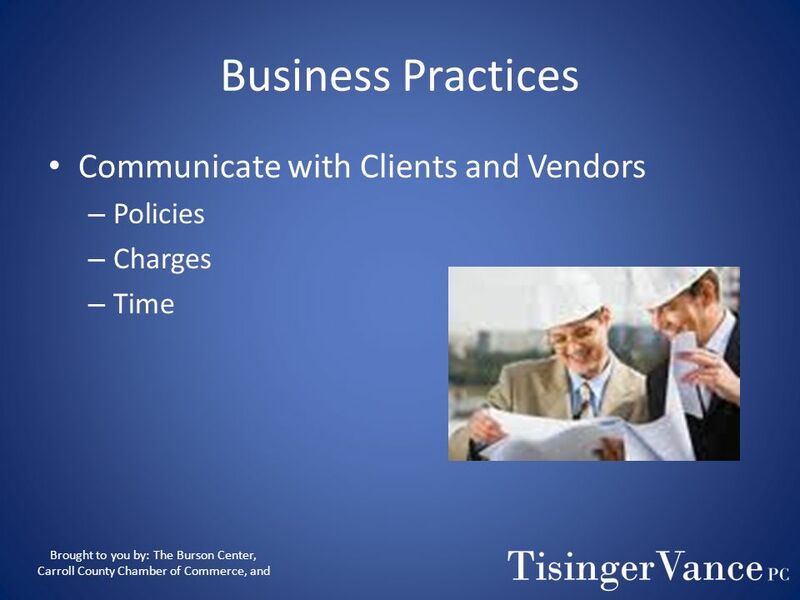 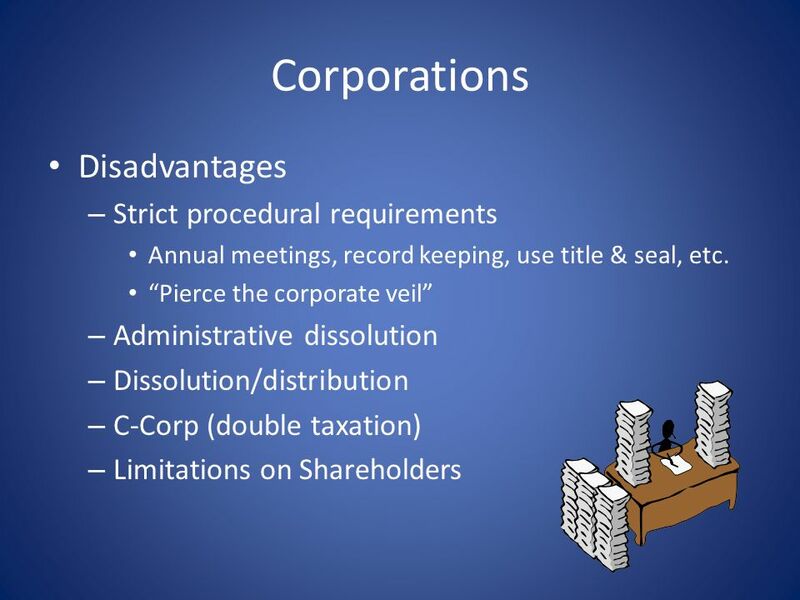 © Business & Legal Reports, Inc Session Objectives You will be able to: Identify the purpose and benefits of. 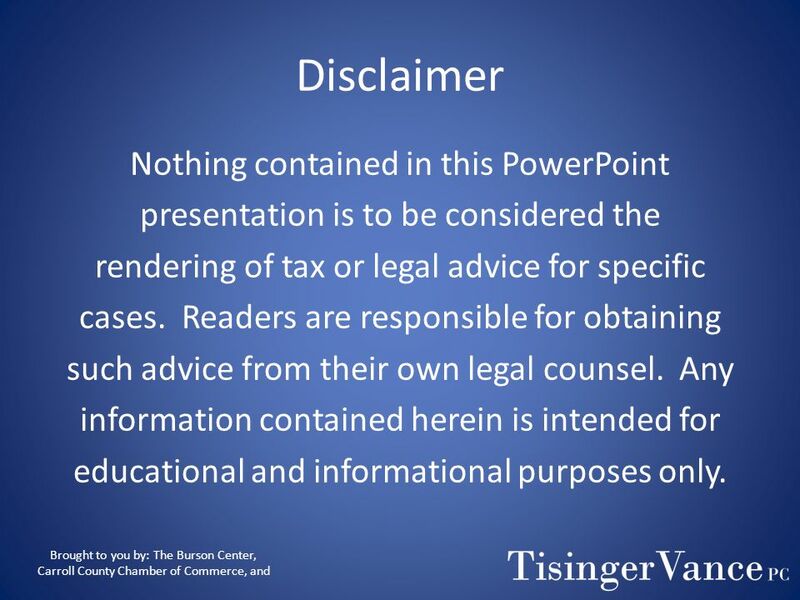 WELCOME TO THE INDUSTRIAL COMMISSION SELF-INSURANCE SEMINAR. 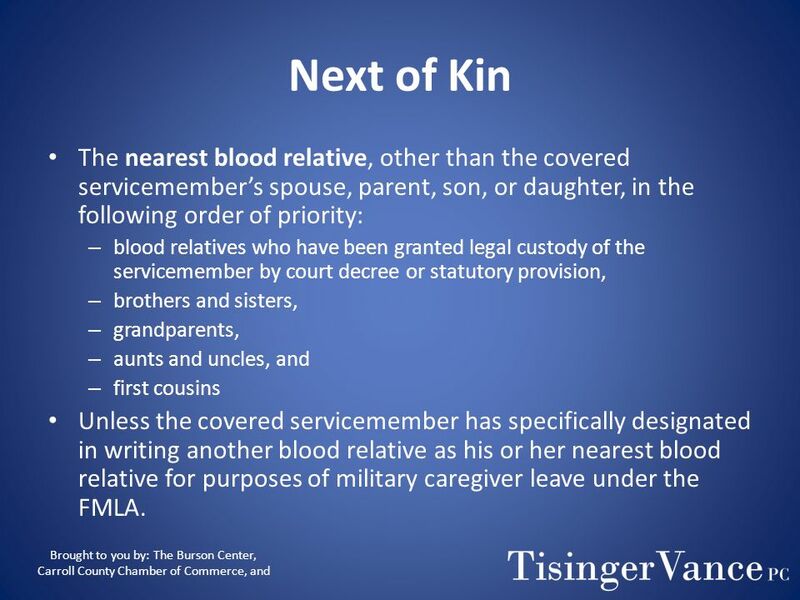 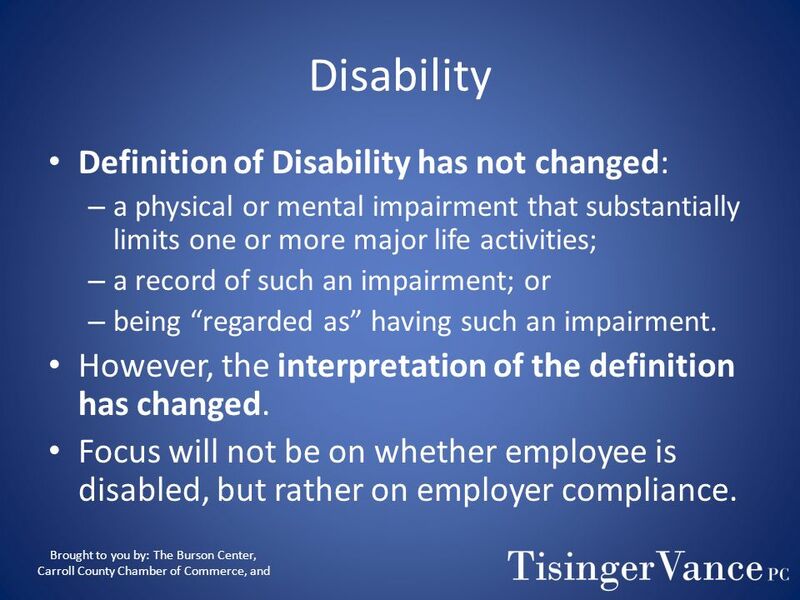 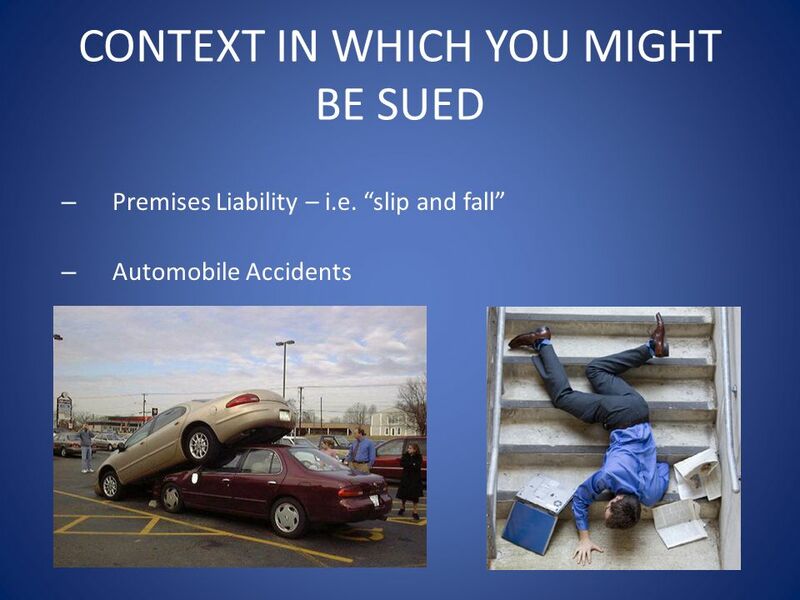 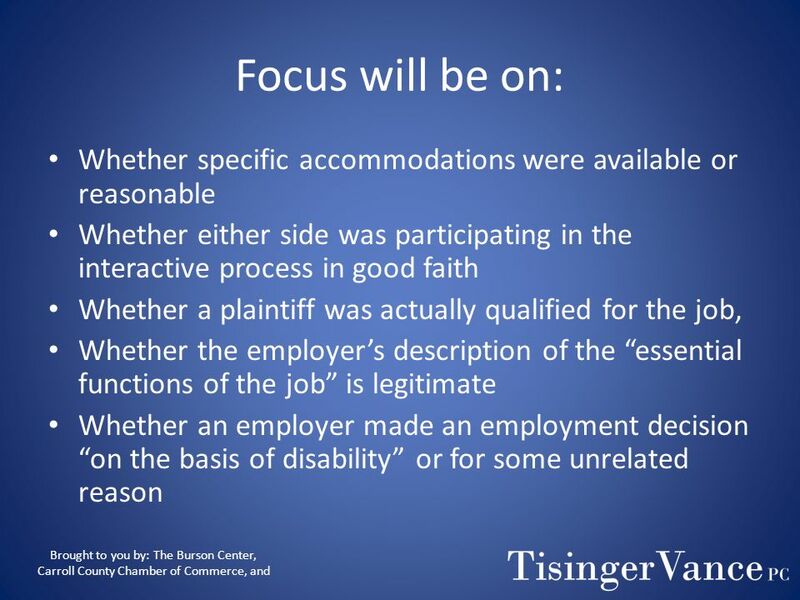 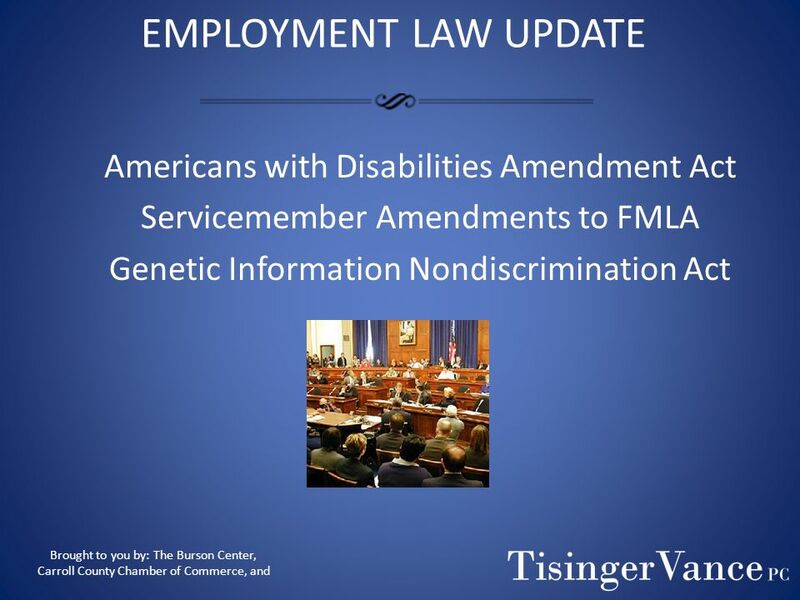 NAVIGATING THE ADA, THE FMLA and the NEW JERSEY FLA A Presentation by: Laura H. Corvo, Esq. 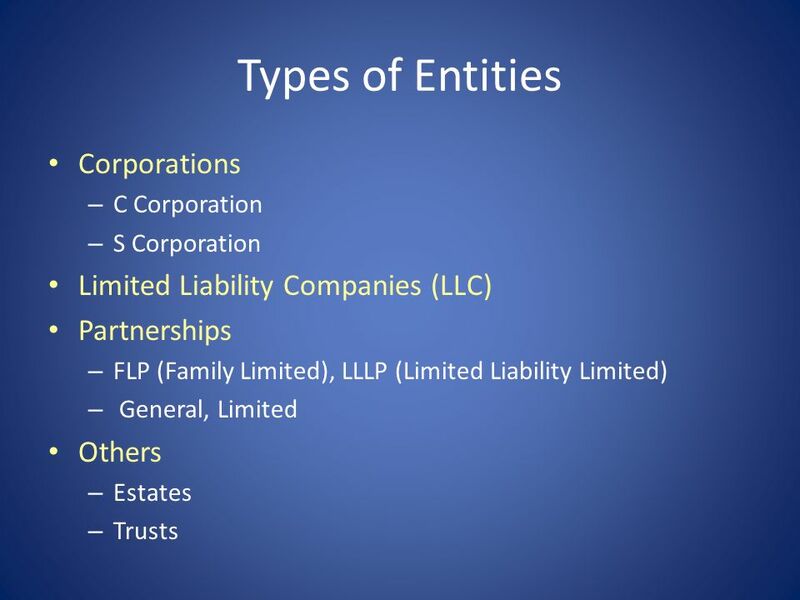 LeClairRyan. 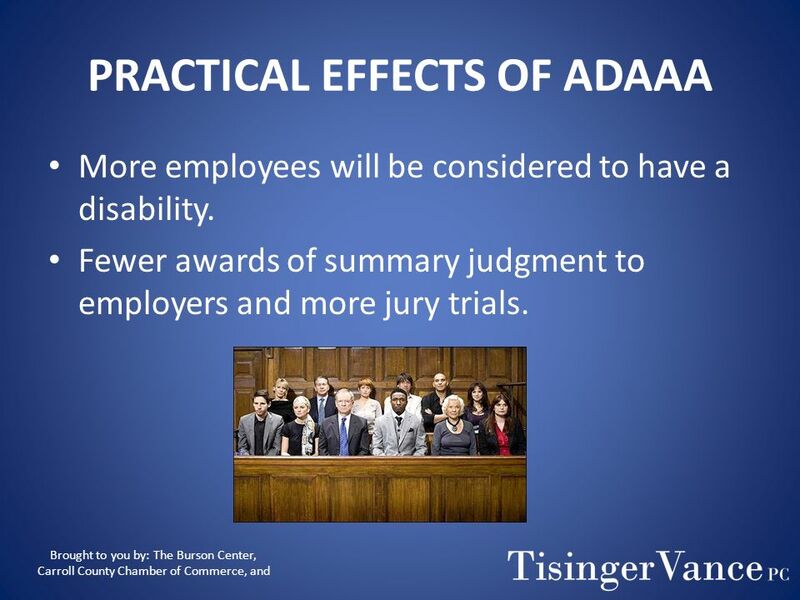 “Bermuda Triangle” ADA, FMLA, and Workers’ Compensation WYOMING ASSOCIATION OF MUNICIPAL CLERKS AND TREASURERS. 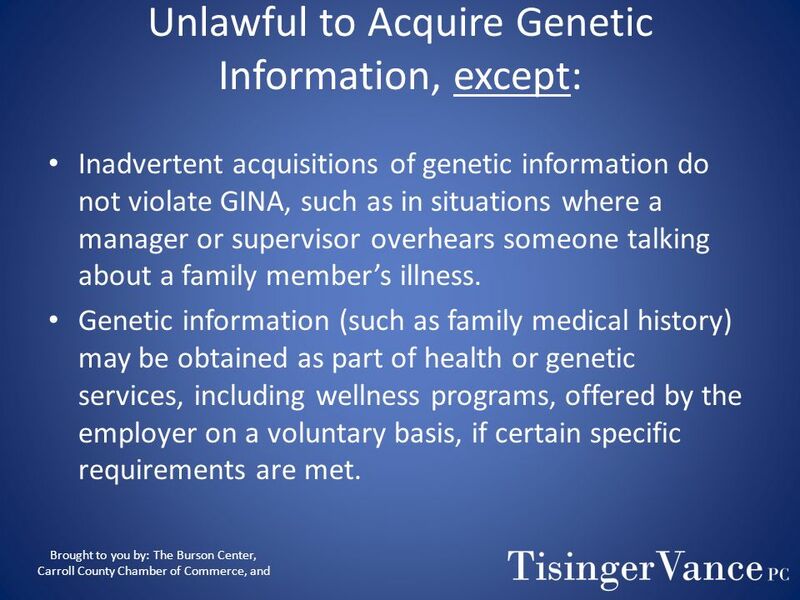 © 2004 Texas Southern University1 Texas Southern University Employee Education and Awareness Training Legal Essentials for Supervisors The Family Medical. 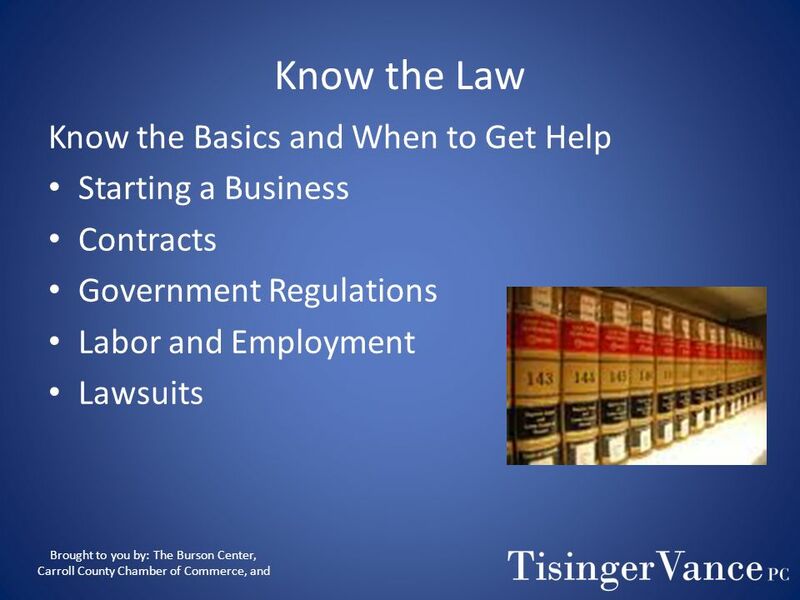 The Legal Series: Employment Law I. 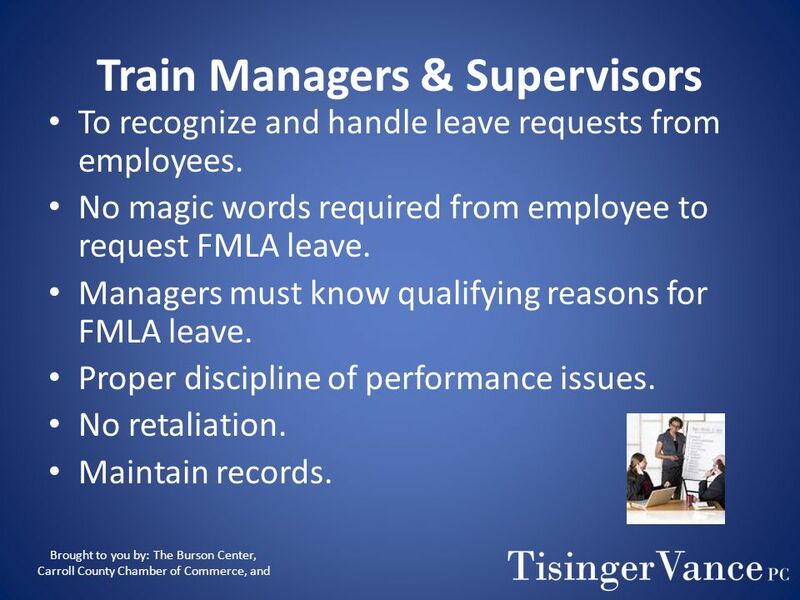 Objectives Upon the completion of training, you will be able to: Understand the implications of Title VI Know what. 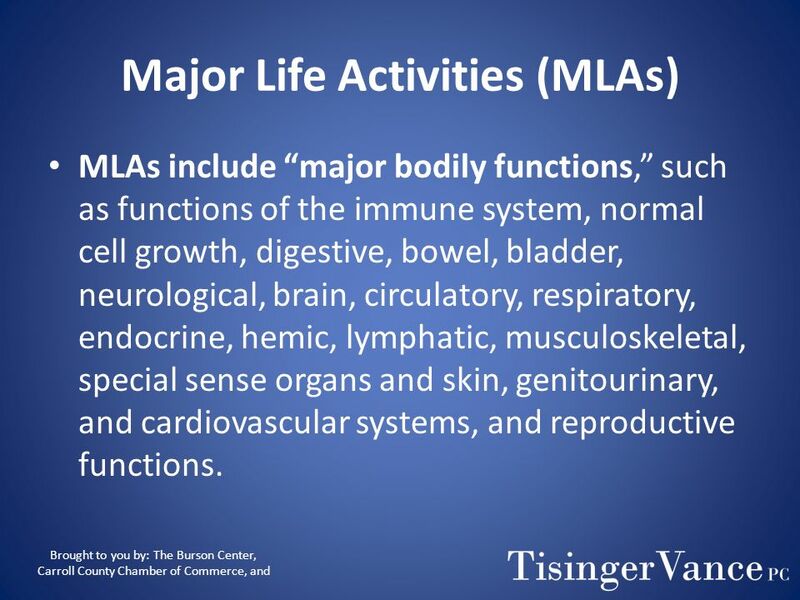 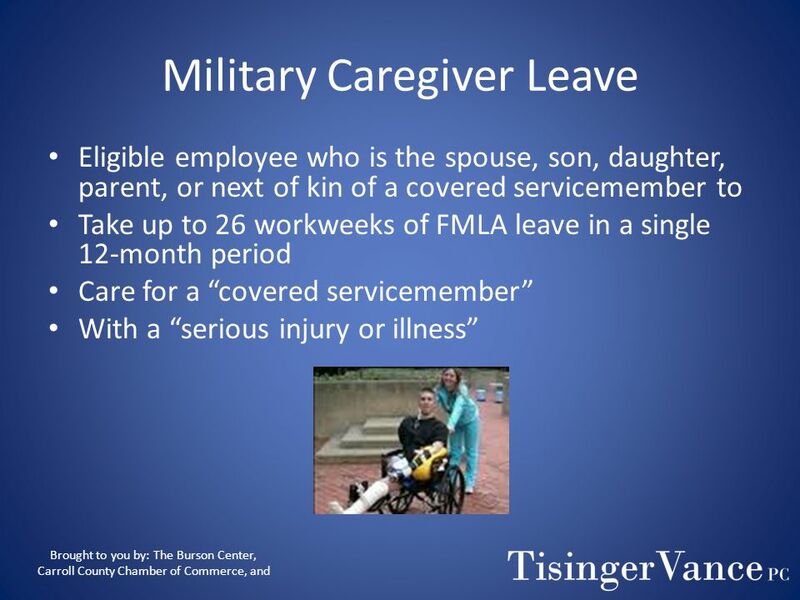 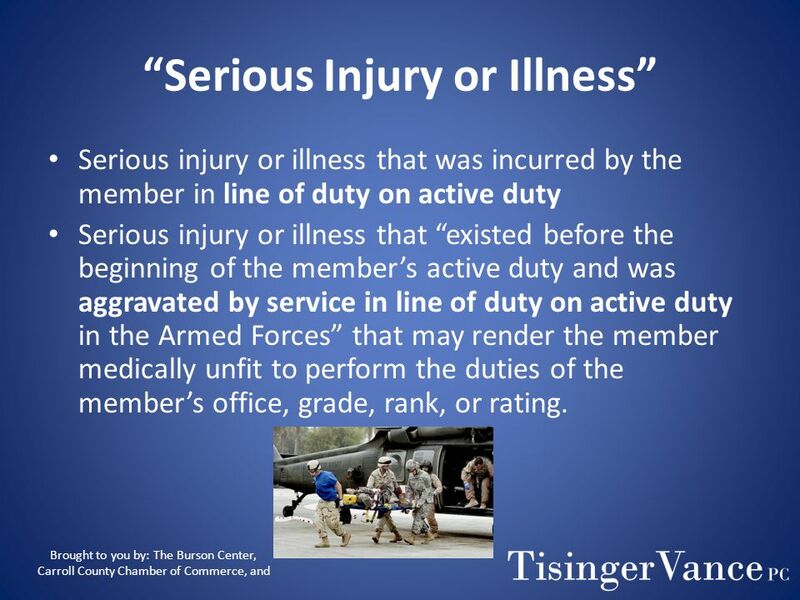 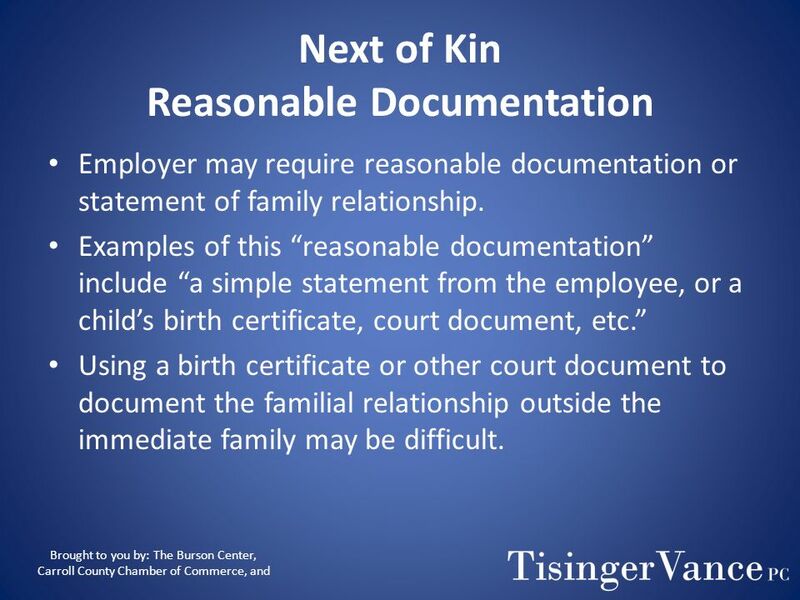 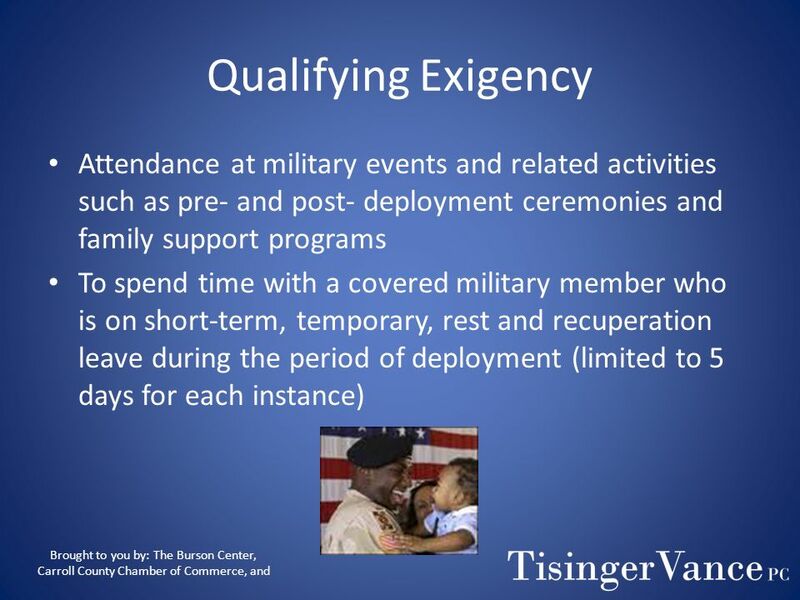 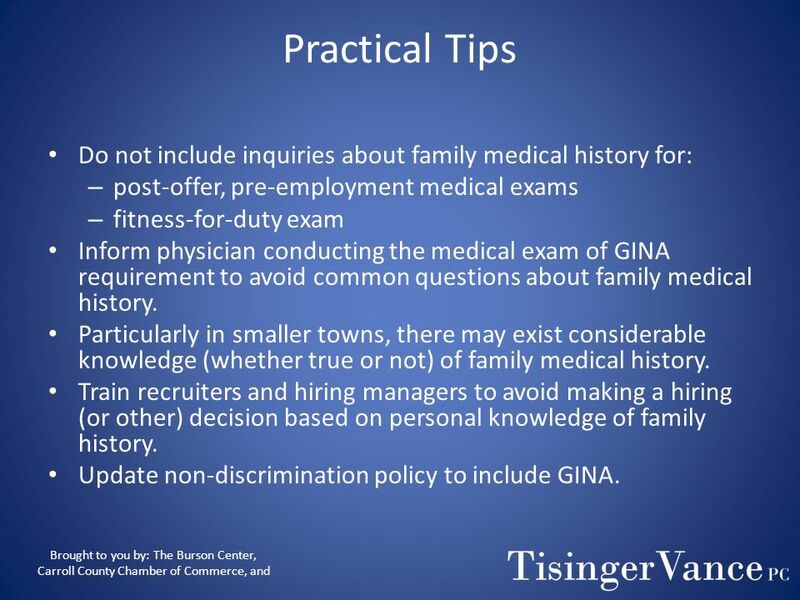 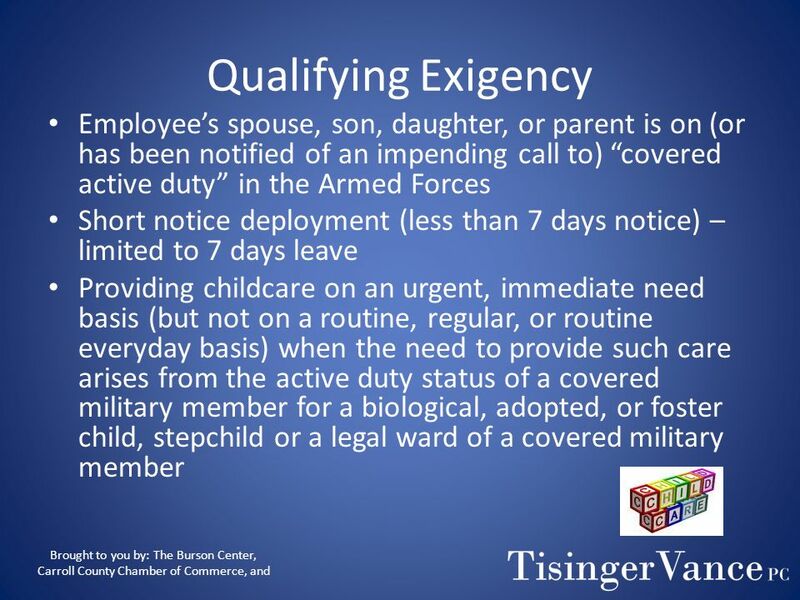 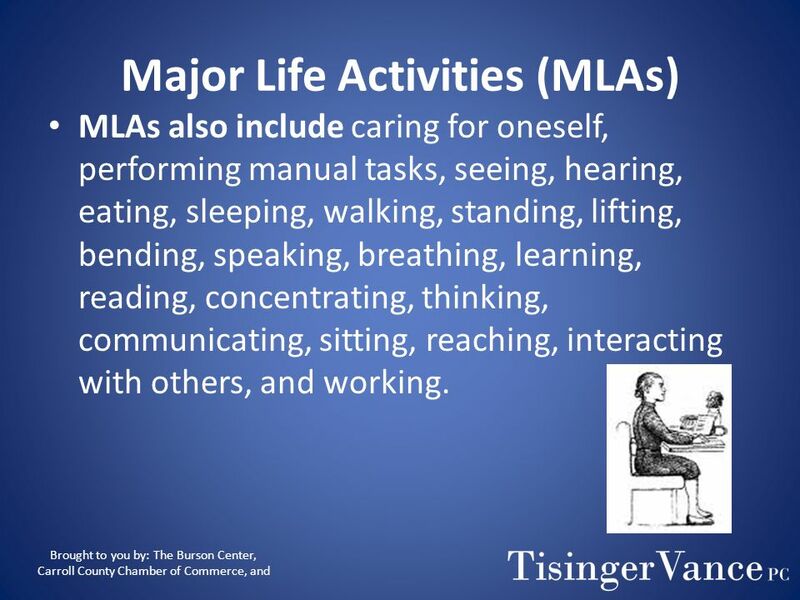 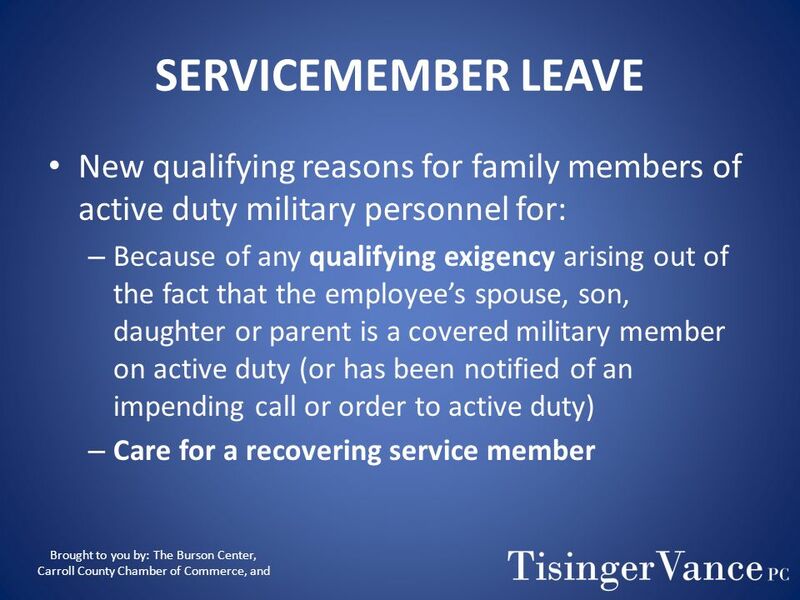 FMLA FAMILY AND MEDICAL LEAVE ACT OF What Is FMLA? 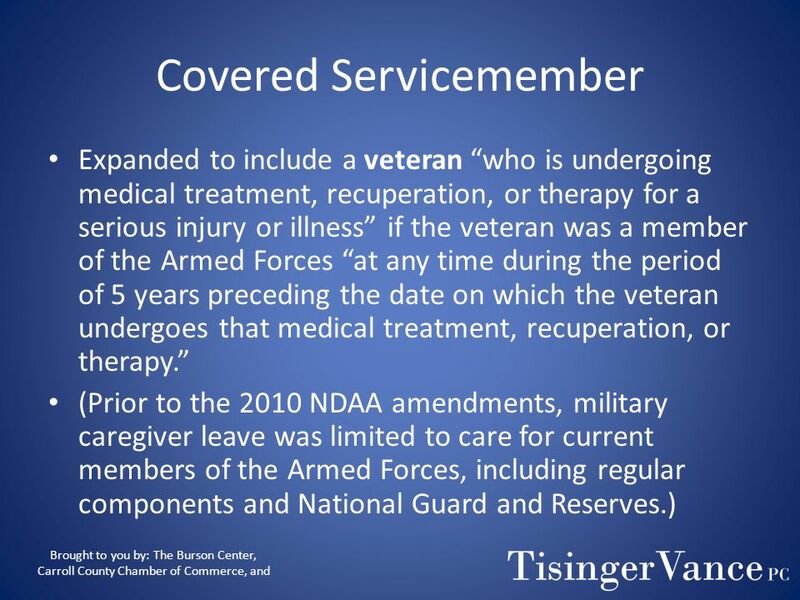 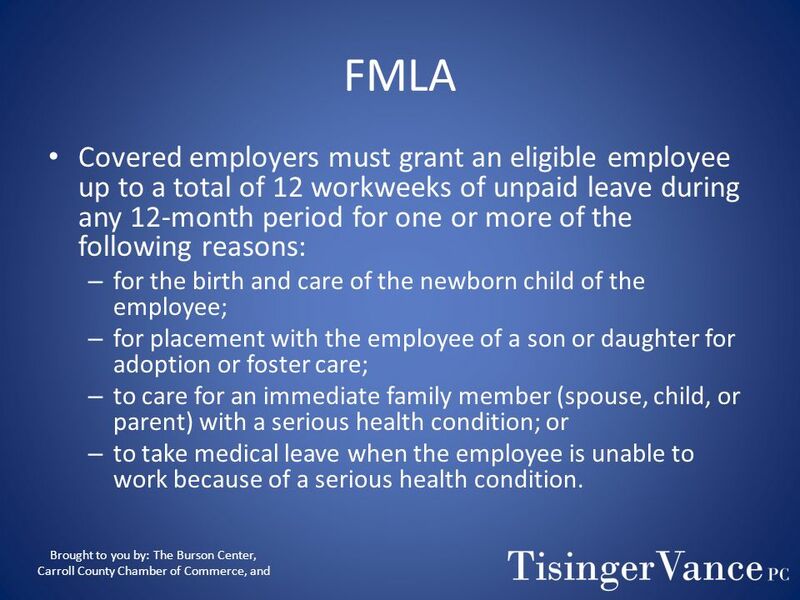 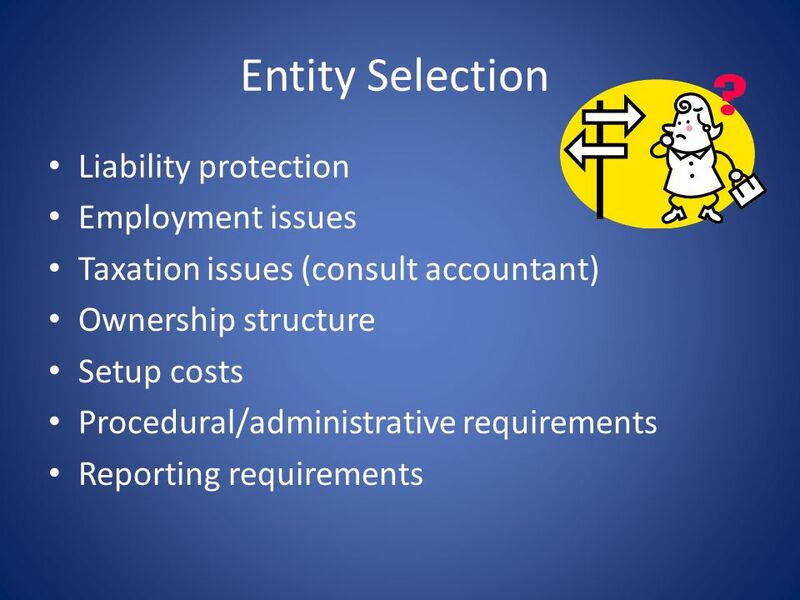  The FMLA entitles eligible employees who work for covered employers to take unpaid, job- protected. 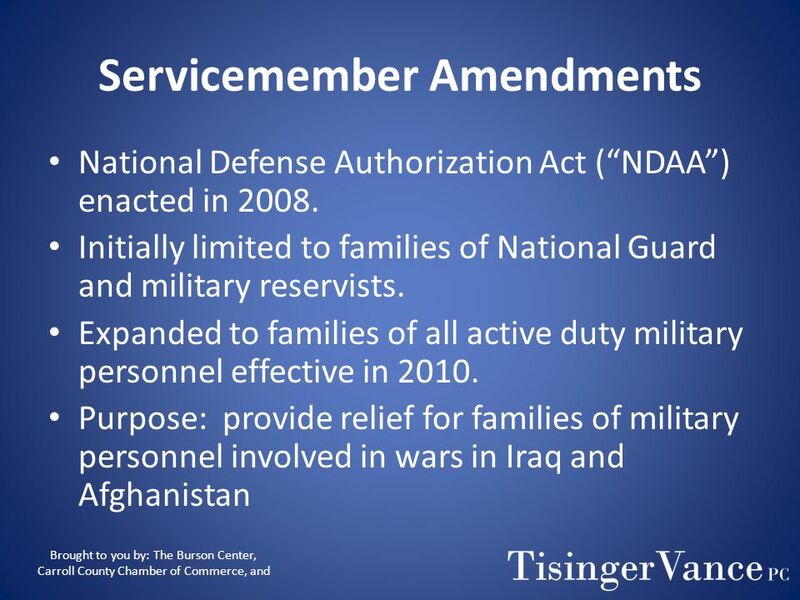 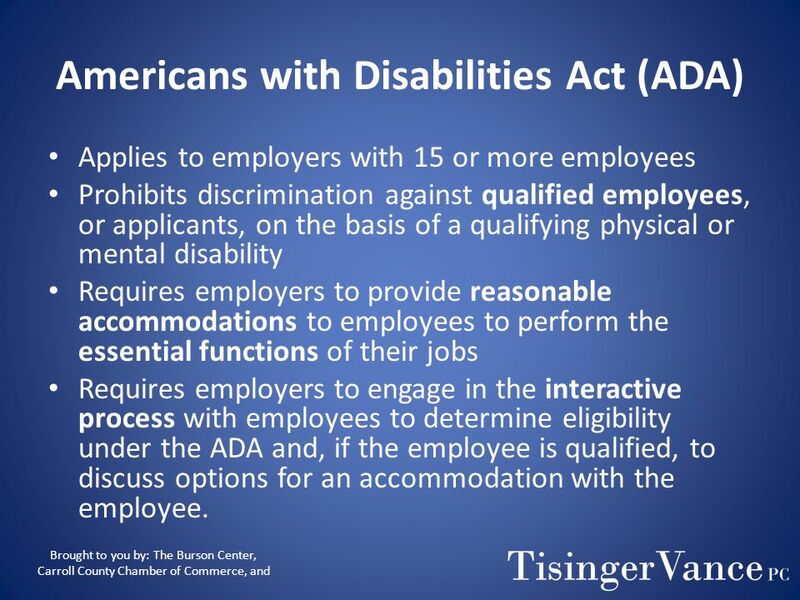 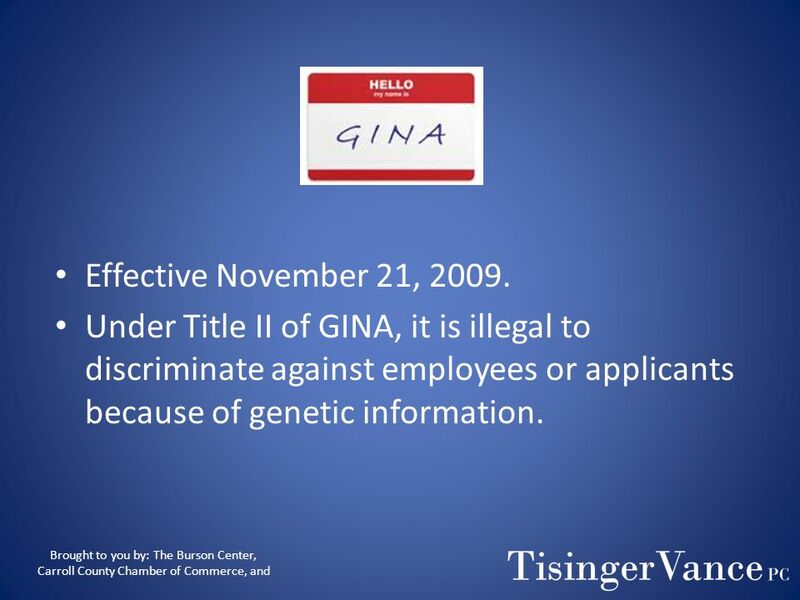 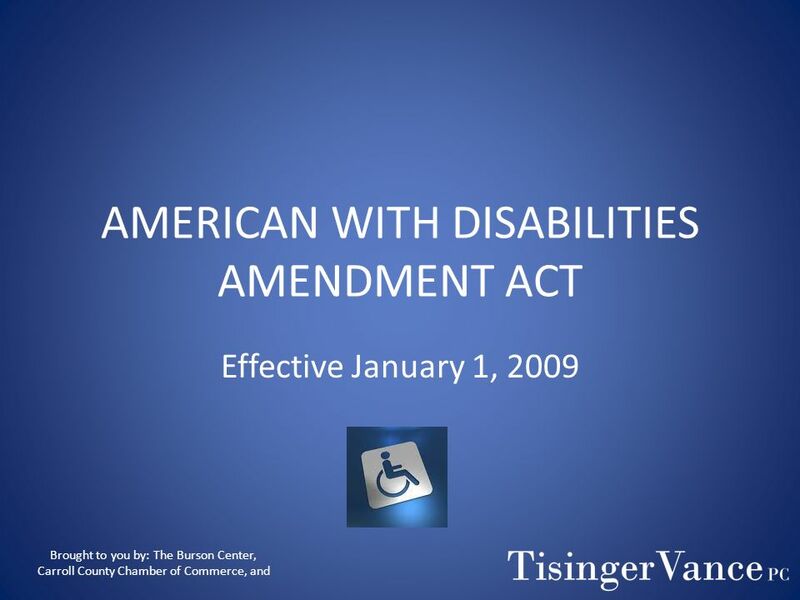 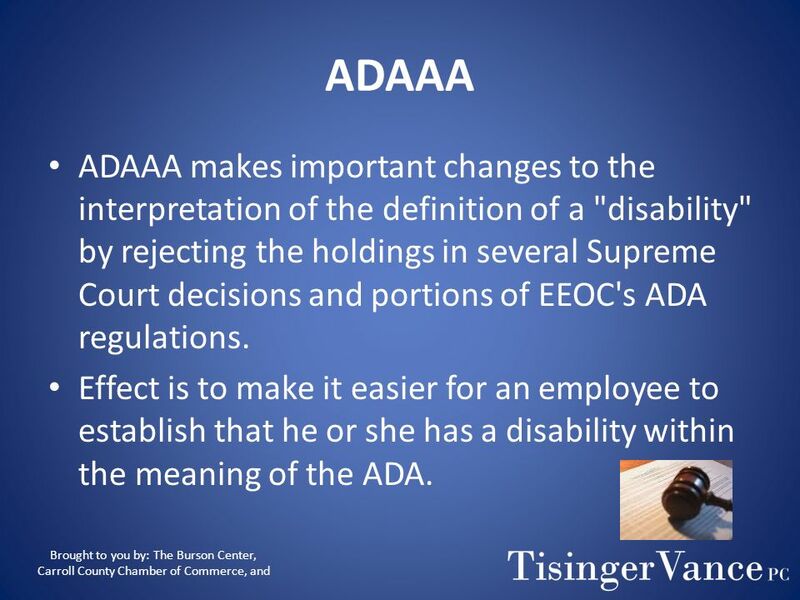 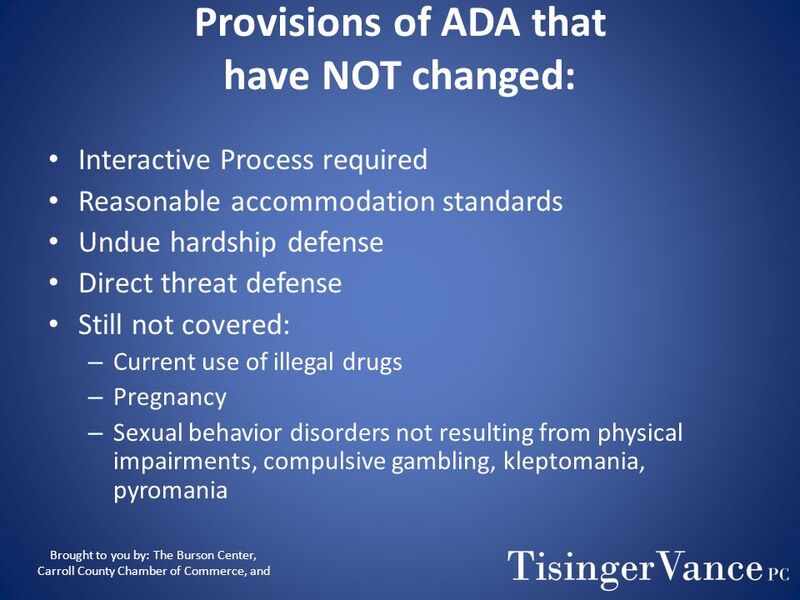 ADA AMENDMENTS ACT OF 2008 (ADAAA) Apryl M. DeLange Hopkins & Huebner, P.C. 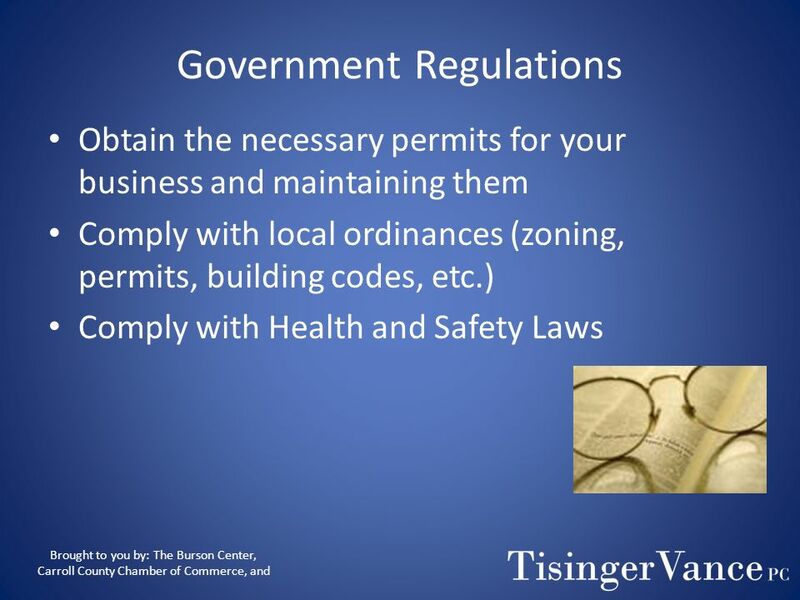 2700 Grand Avenue, Suite 111 Des Moines, IA 50312 Telephone: (515) 244-0111.